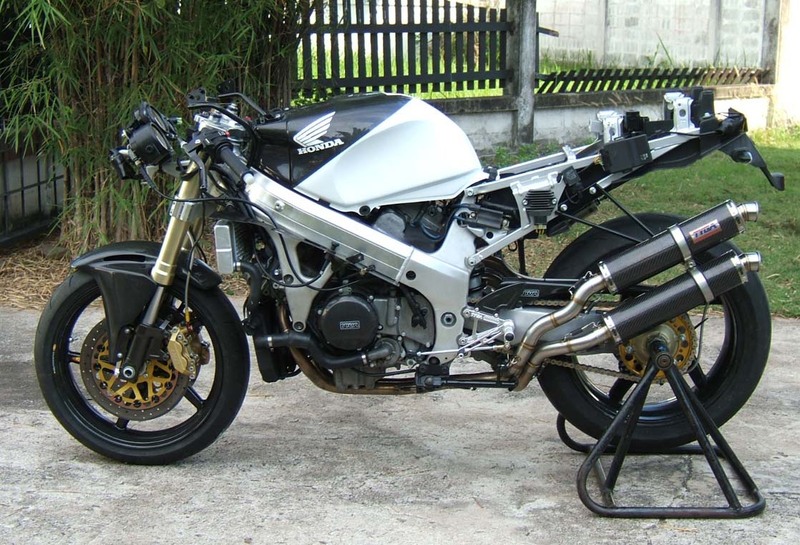 The NC35 is one of those bikes that has an aura of quality and class which transcends time and obsolescence. 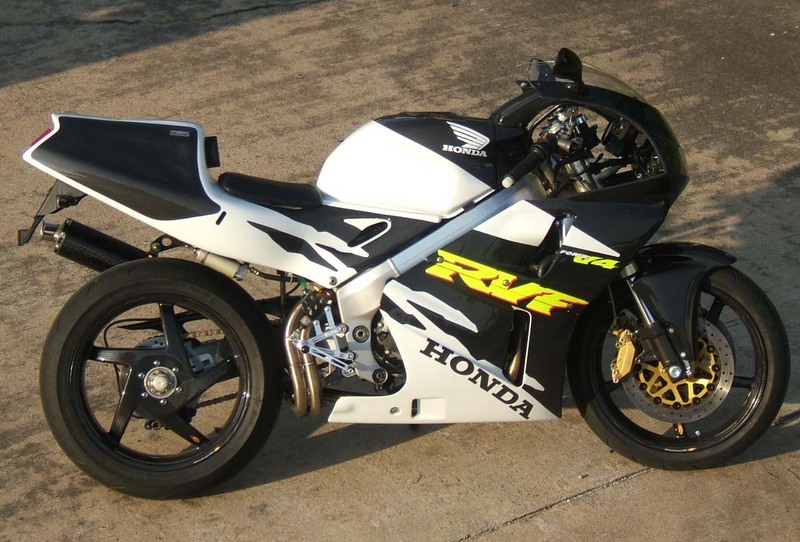 Many other early 1990s bikes have faded into oblivion but yet the little RVF is as much loved now as when it was unveiled in 1993. 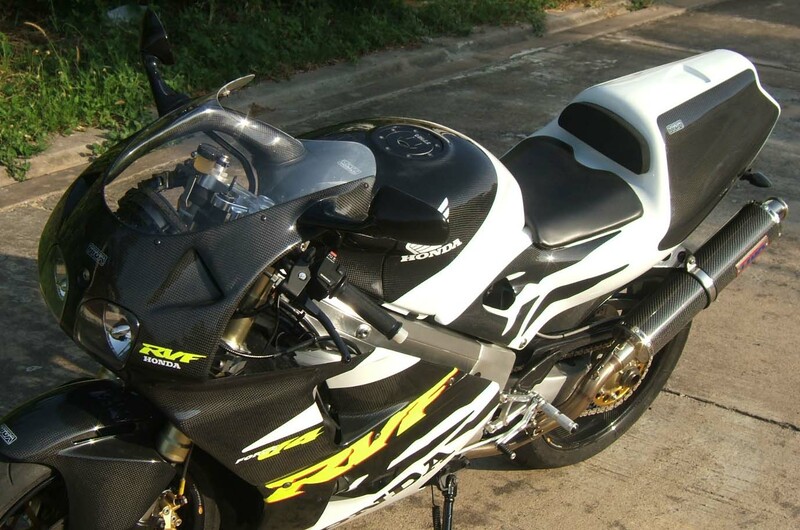 There are many bikes which are much faster, lighter and dare I say, handle better, but somehow, even now, the RVF is still a very capable and satisfying bike to own and ride. 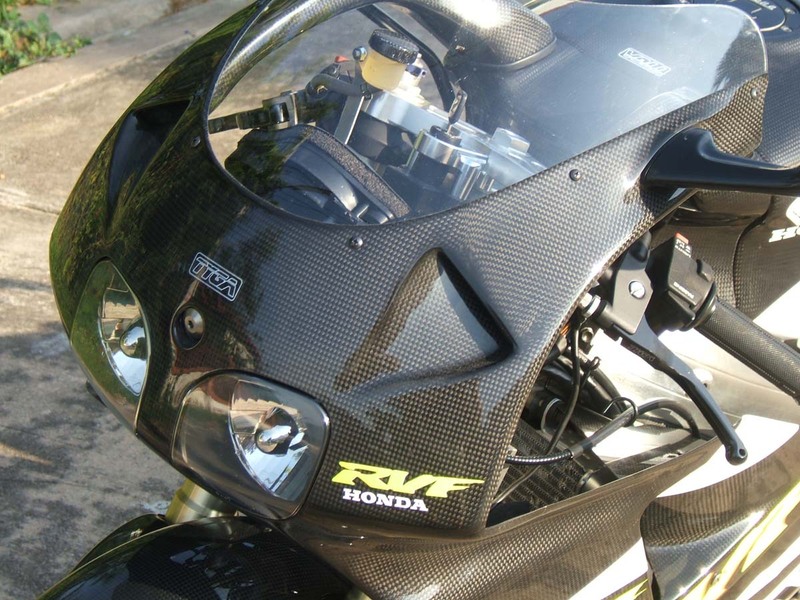 We have built many projects using the RVF over the years, but always with major changes to the bike's appearance. 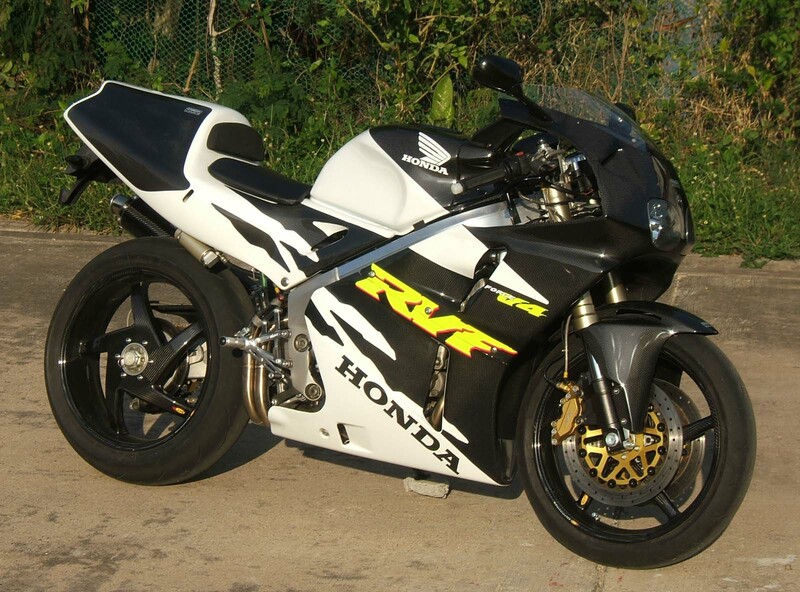 Our body kits have been very successful but this time we wanted to build a different type of bike. 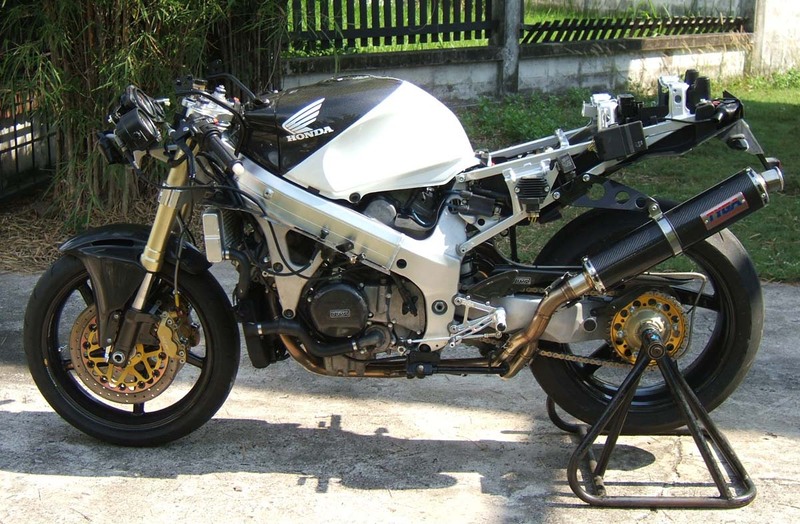 The idea of this project was to take a stock bike and upgrade it; while at the same time retaining the overall general appearance of the bike as it left the factory 15 years ago. We wanted it to be lighter, faster, stop quicker, have better suspension and to have looks and specification to draw attention wherever it is parked. 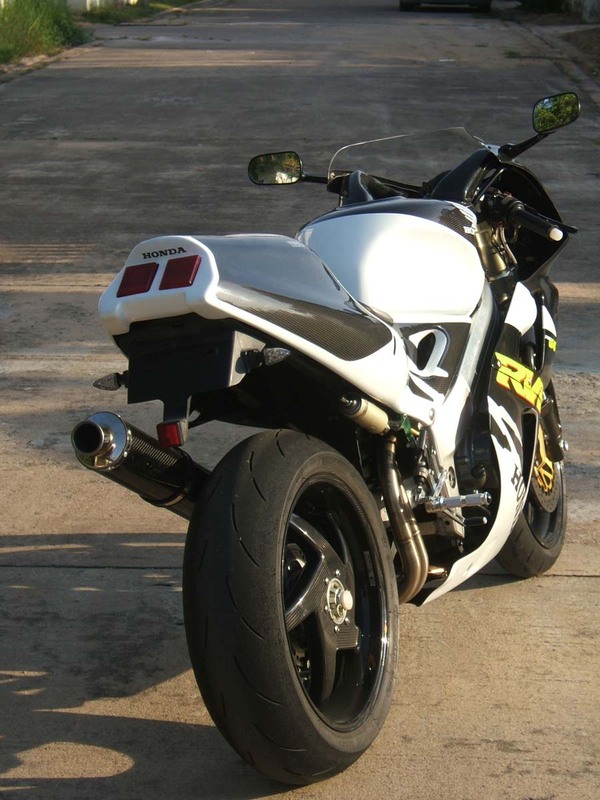 To achieve this, we decided it was time for TYGA to introduce full carbon bodywork and the first model to get this was to be the NC35. 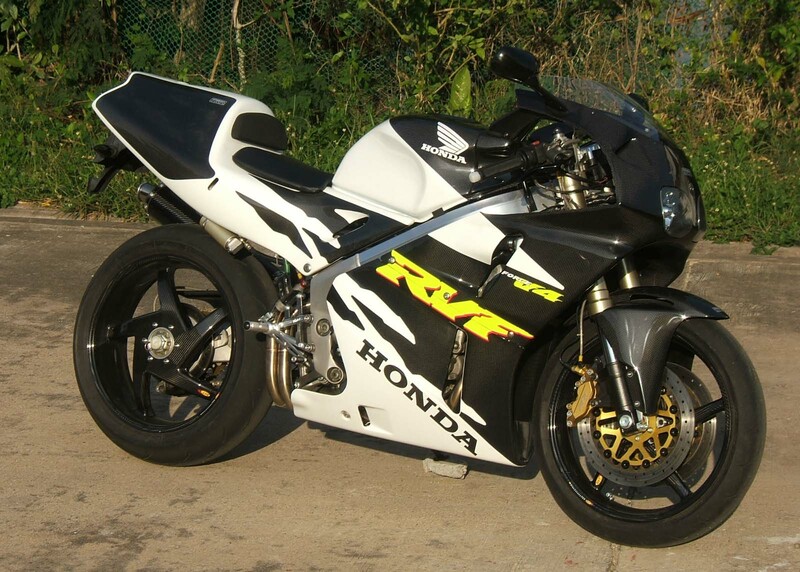 To compliment the bodywork, we contacted Blackstone Tek in South Africa and acquired a set of very trick carbon RC45 wheels. 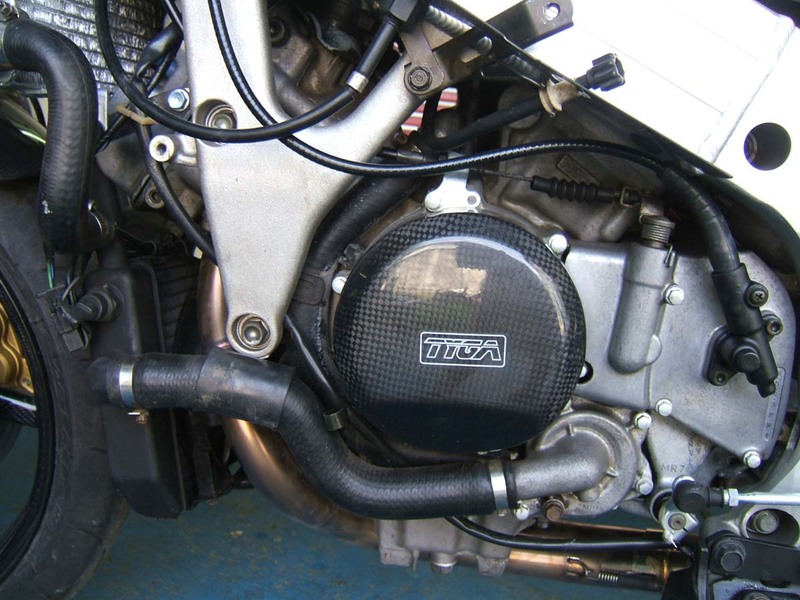 We then added our full range of NC35 applicable TYGA Performance products and 6 months later this is what we got! 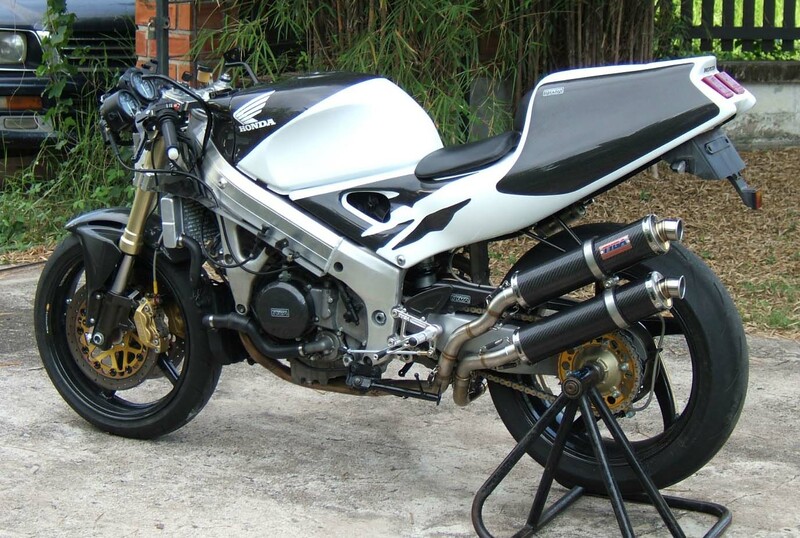 The first hurdle was to find a suitable bike to start with. 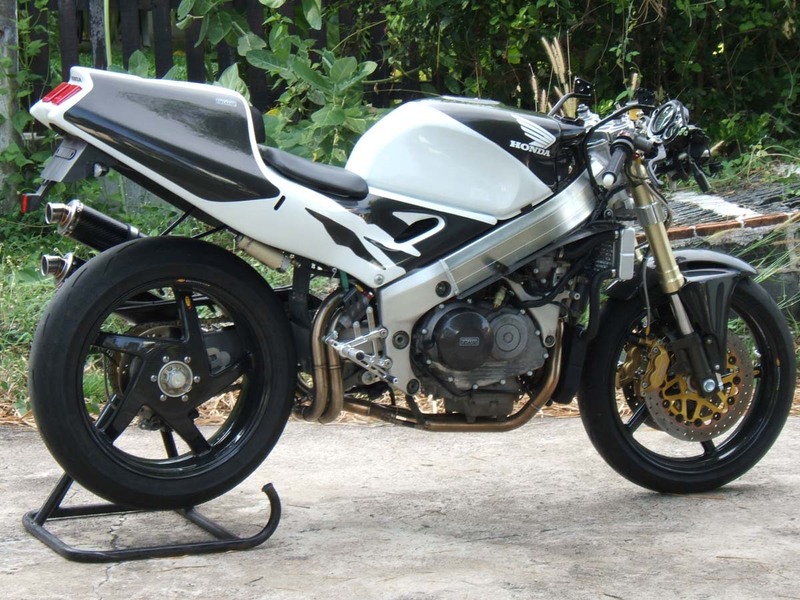 We wanted a road legal registered bike and found one without too much trouble. 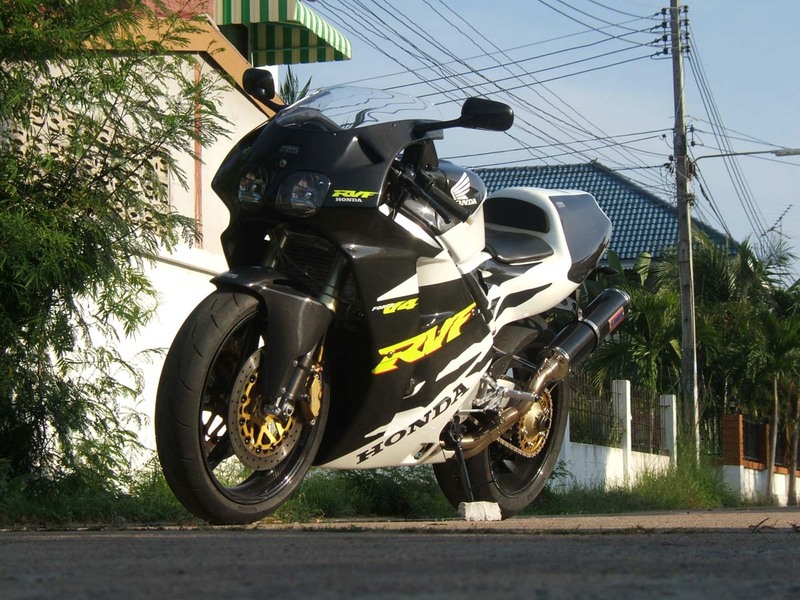 Most of the NC35s here in Thailand were registered prior to 1995 and have had a fair amount of work in the last 14 years. 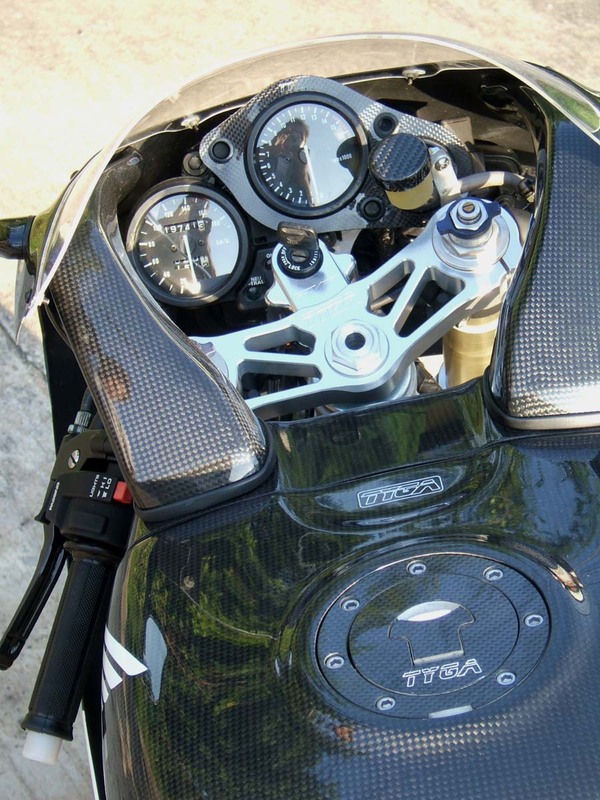 The locals aren't shy to rack up high mileages, do home maintenance and the road conditions here are not too conducive to keeping motorcycles in good working order. 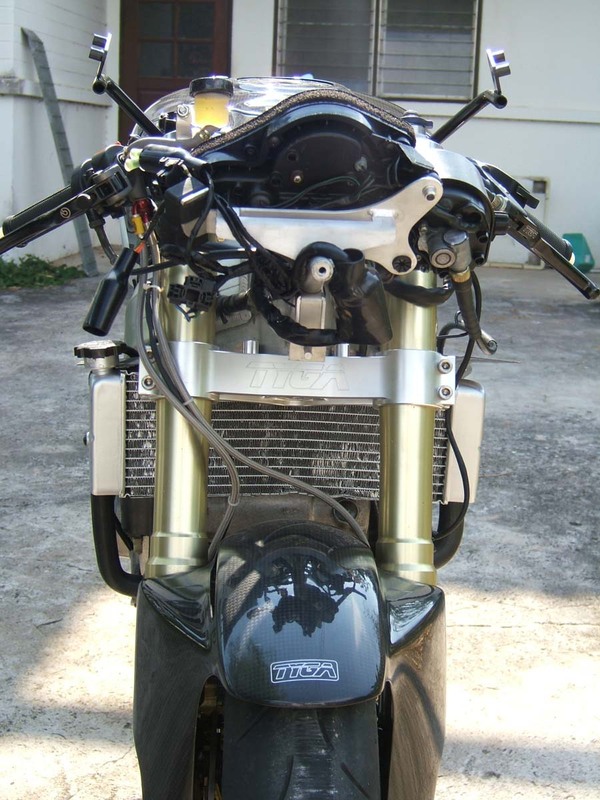 Our bike, at first glance, seemed ok and, apart from the common water pump housing oil leak, ran ok. 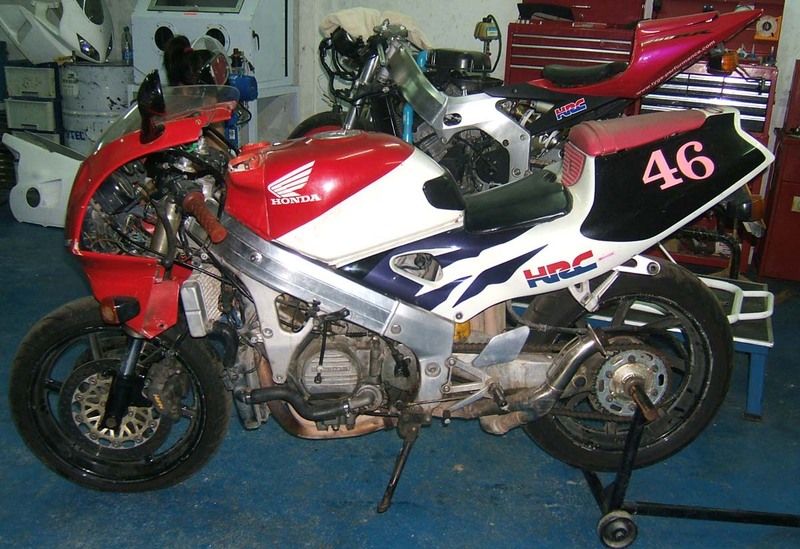 It probably would have run like that for another few years but as the strip down showed, it was not exactly as Honda intended it. 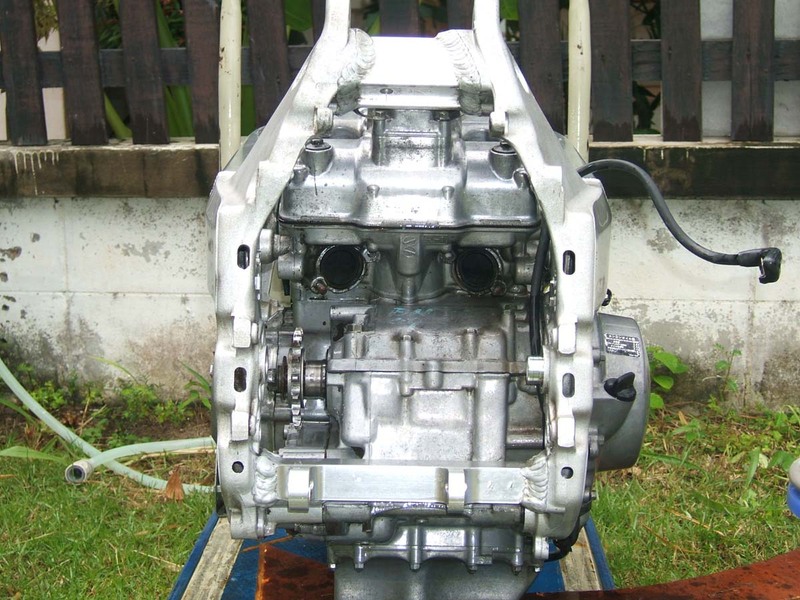 Luckily we were planning to discard many of the parts for upgrades but it can be a bit challenging when every single component had either been butchered, rusted seized, botched or replaced by the wrong part. 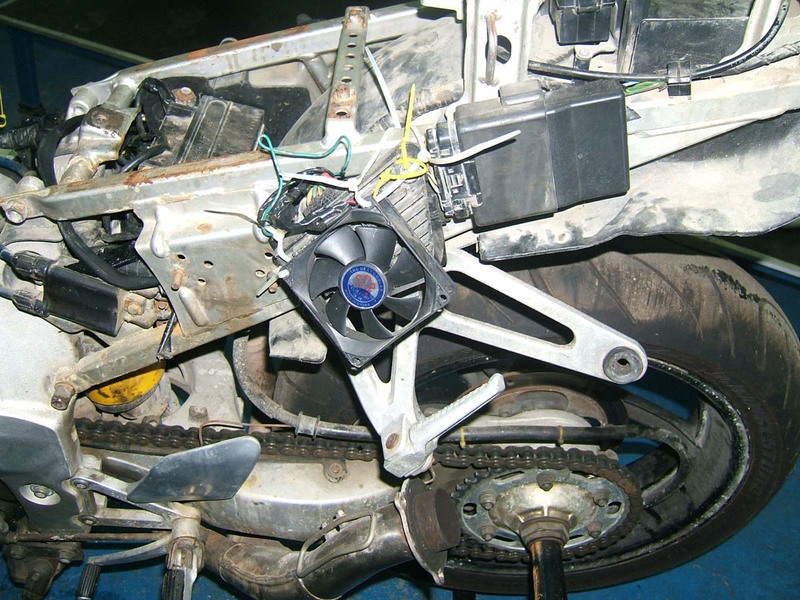 It was also fortuitous we had a spare parts bike in which to grab things off when the need arose. 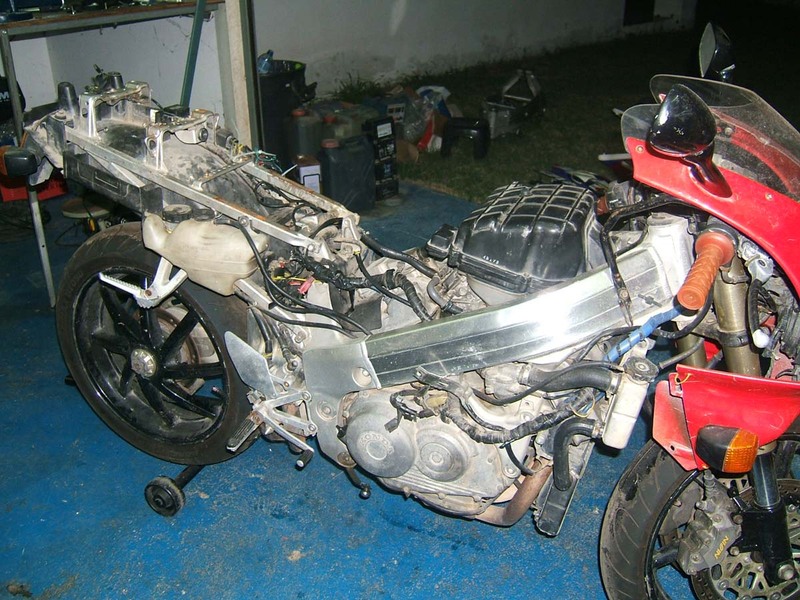 The pictures show the extent of the work needed to restore this bike. 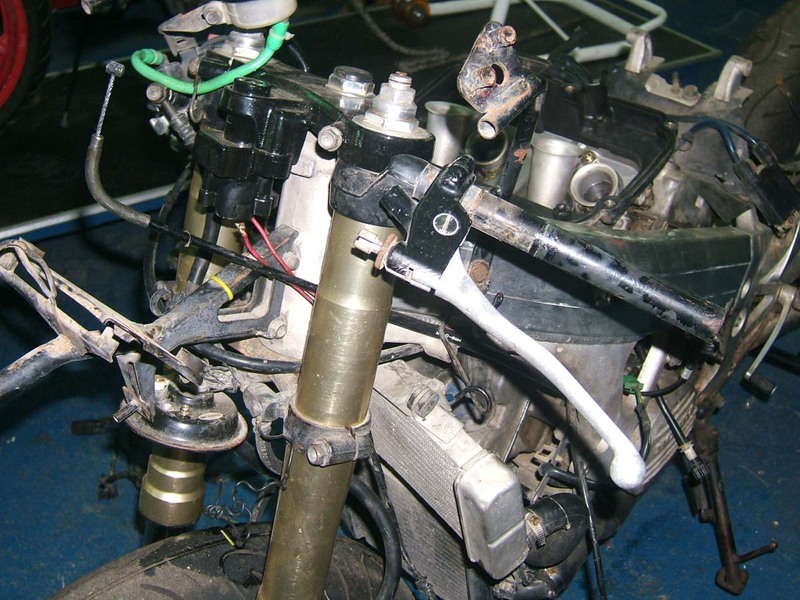 It was amusing and depressing in equal measure discovering the wonderful solutions to regulator overheating or how to run to bike on a superbike battery. 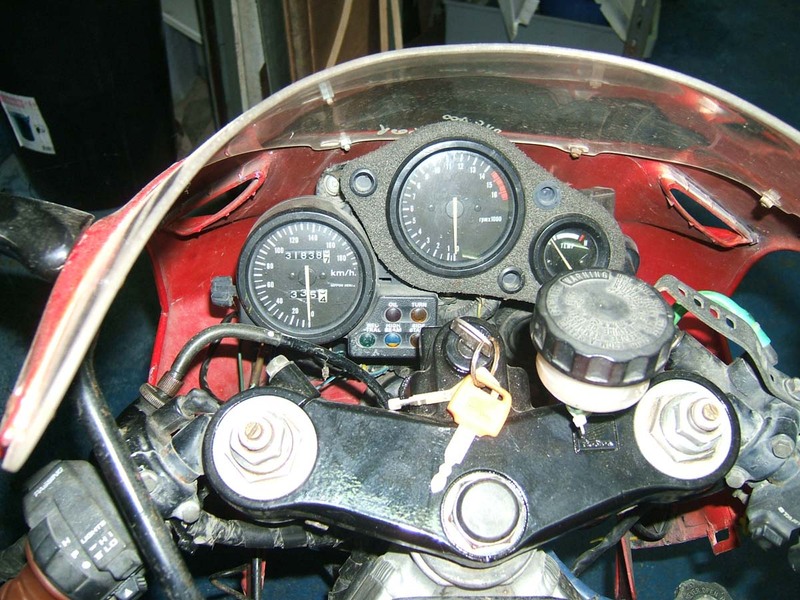 I must admit the mouse nest in the swing arm I was not ready for, nor half a field of dirt in the swing arm with the other half a field in the lower radiator. 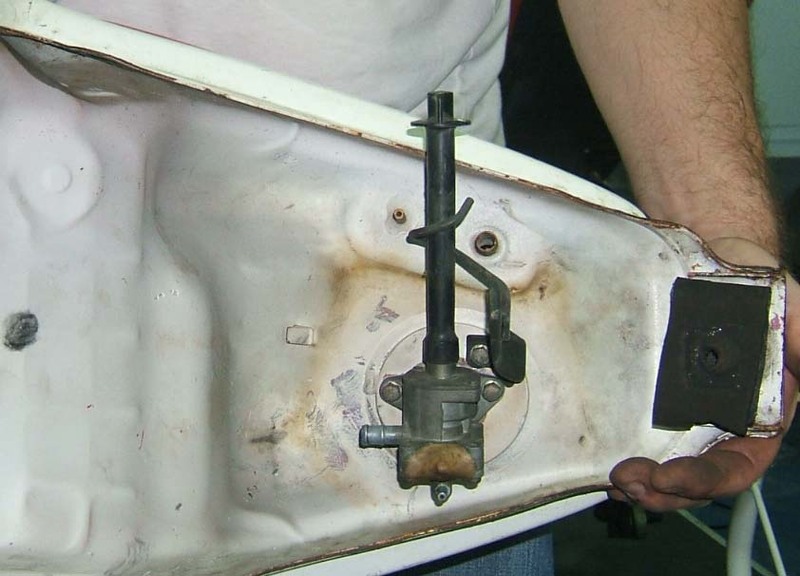 Picking out the individual fins of the radiator for hours with a cut down hacksaw blade is for the patient among us. Only to discover once painted and installed that it has sprung a leak along the way is for those with the patience of a saint! 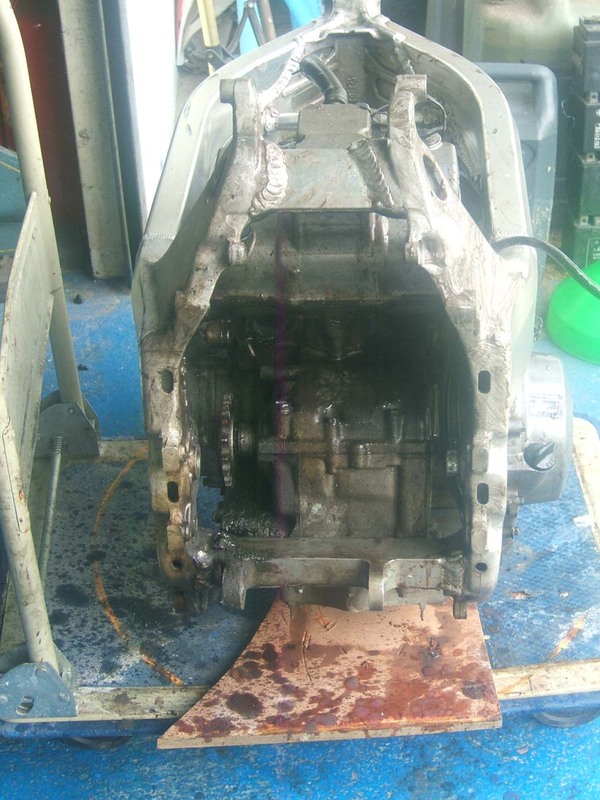 The engine and frame cleaning nearly had Greenpeace protesting outside the gates; such was the state of the pollutants and nasties clinging to the aluminium. 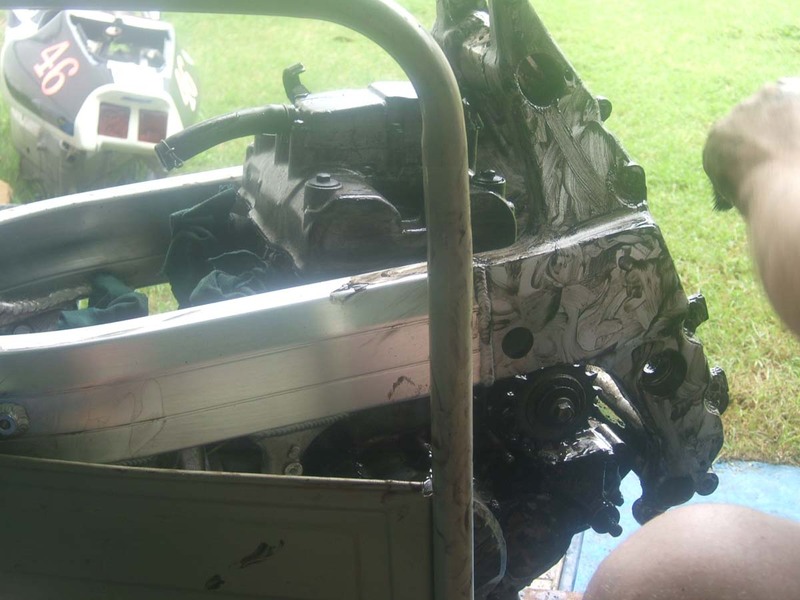 The corrosion didn't give up without a fight and took a few goes with the super strong engine cleaner before it shifted. 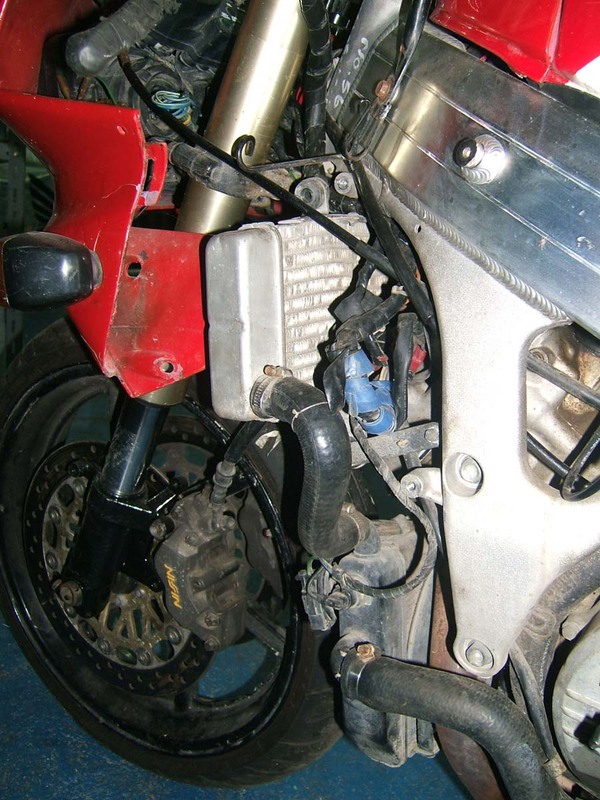 The swing arm required something more drastic and was blasted. 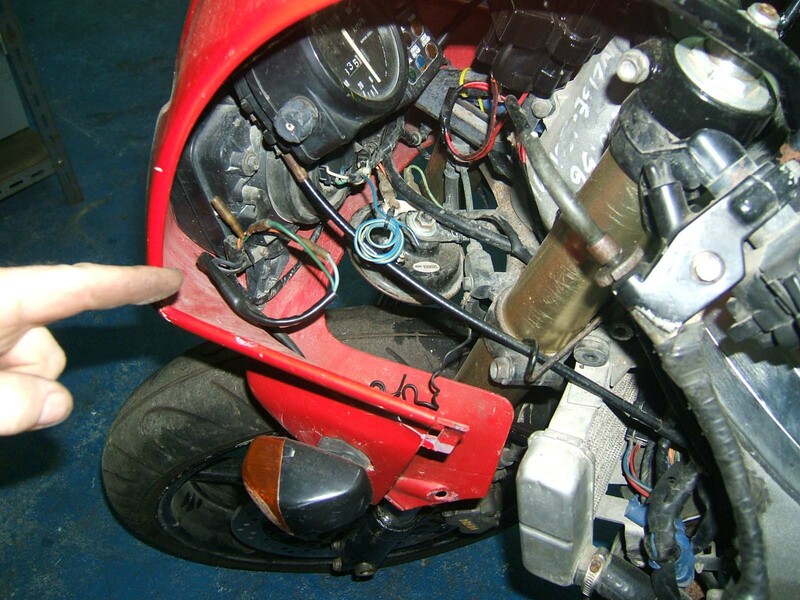 The rear hub and the brake holder which fits in the swing arm were both solidly seized (probably all that mouse urine). 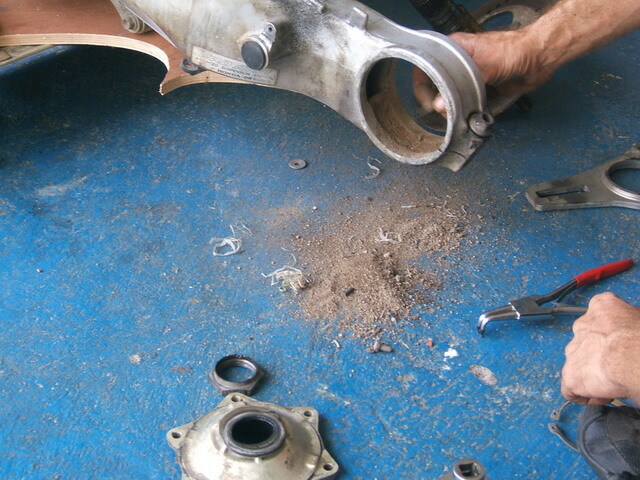 Forks were straight but overhauling was required on the internals and adjusters. 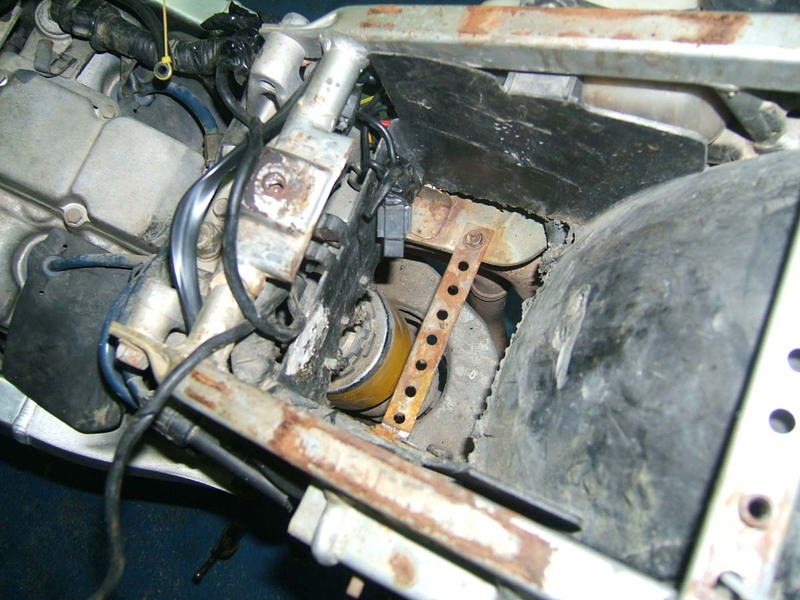 Wiring harness and much of the switch gear was binned along with the rear subframe and undertray. Bodywork was nasty and the tank although in itself was ok, the tap and the front rubber had been 'repaired' I could go on but the pictures pretty much show what we were up against. We cleaned up the bolts and fasteners and sent them off to be rezinced. 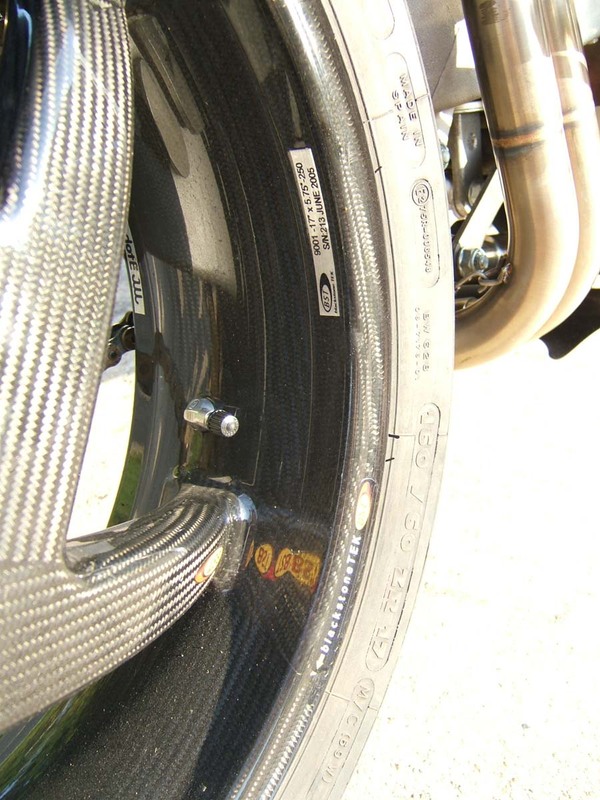 Carbon wheels were on order and as soon as they arrived, we could start the long job of rebuilding. 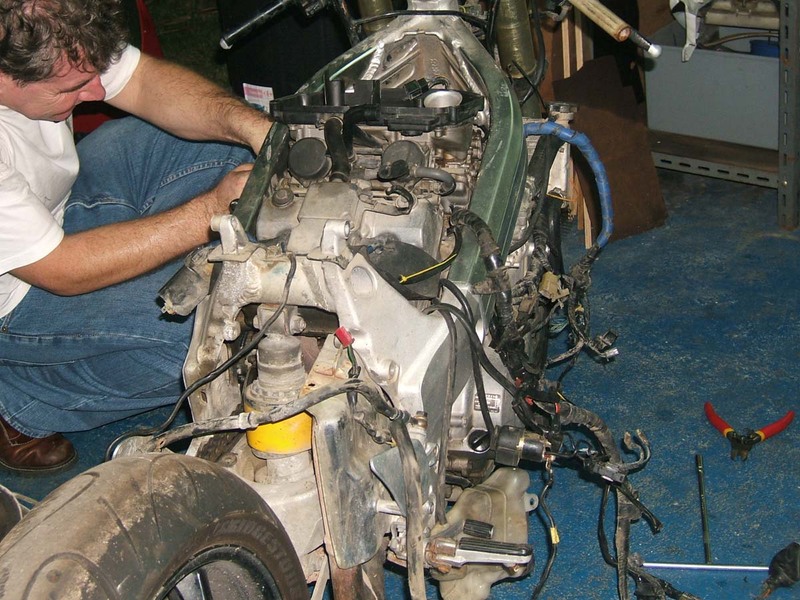 Rebuilding the NC35 was a bit of a task due to the general condition of the components. 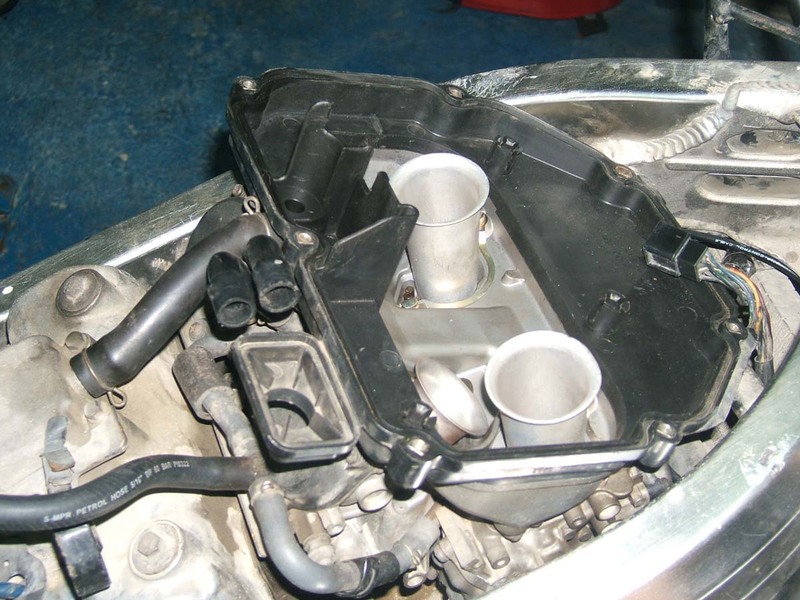 The cooling system sprang 6 leaks and both radiators were replaced in the end. The carbs were pretty dirty and required several attempts before the float bowls would seal properly. 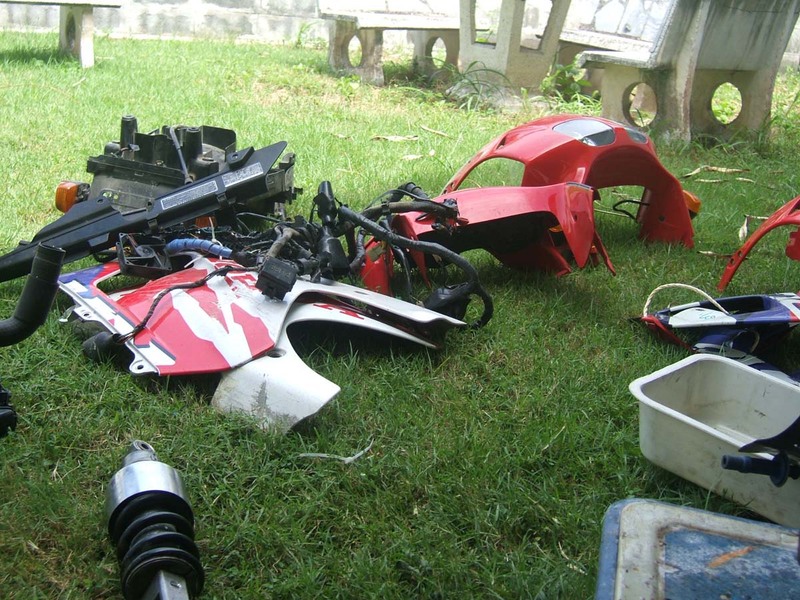 Luckily, we didn't need to get too involved with many parts because they were replaced with new or upgraded items. 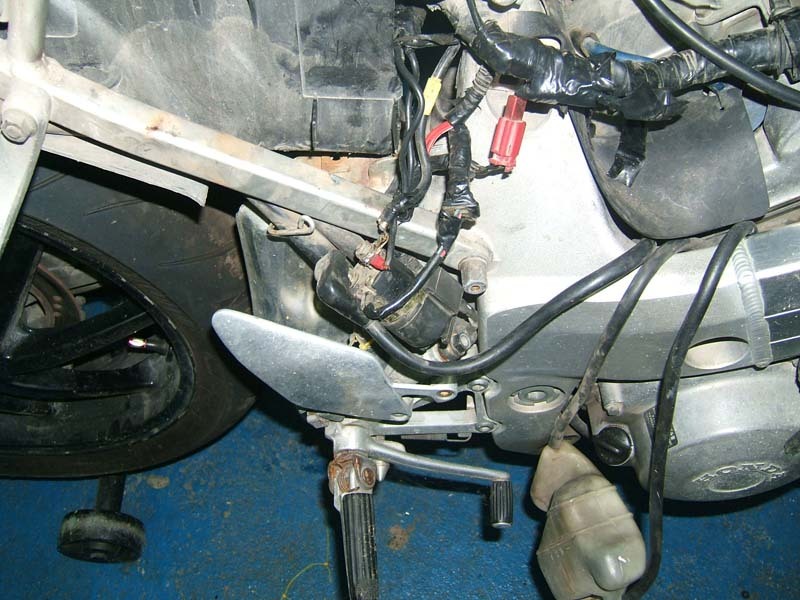 The Stock NC35 triples (especially the lower clamp) are well known for not really being up to the task. 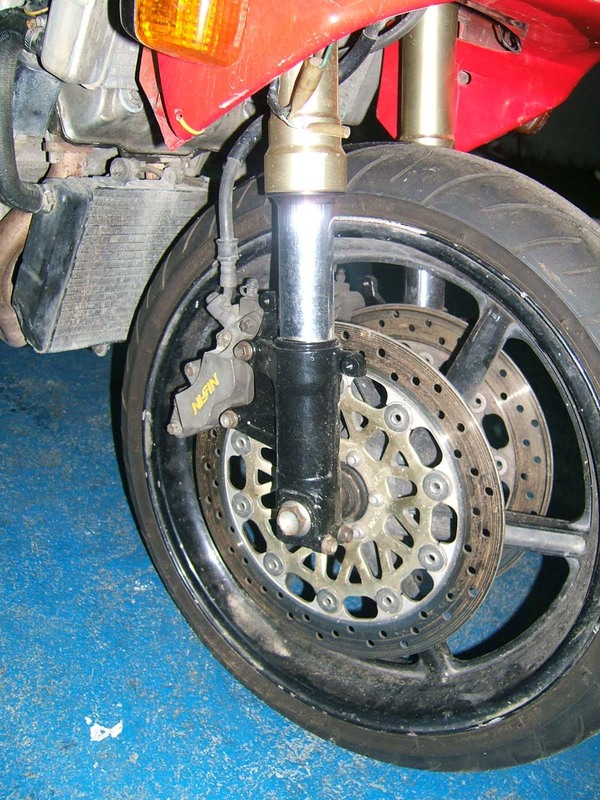 Most bikes have either suffered from the fork angle being too great from an accident or too shallow from too many wheelies! The twin pinch bolt, high grade lightweight TYGA CNC machined lower triple is substantially stronger than the stock clamp and will take care of this problem. The TYGA CNC upper triple has cut outs but has been designed to be stronger than stock without an unnecessary increase in weight. 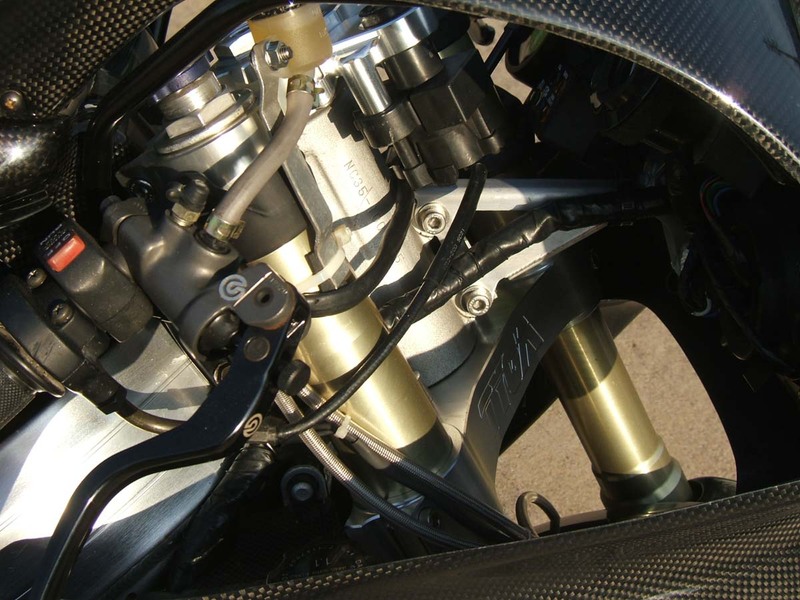 The stem holding them together is also high grade alloy. 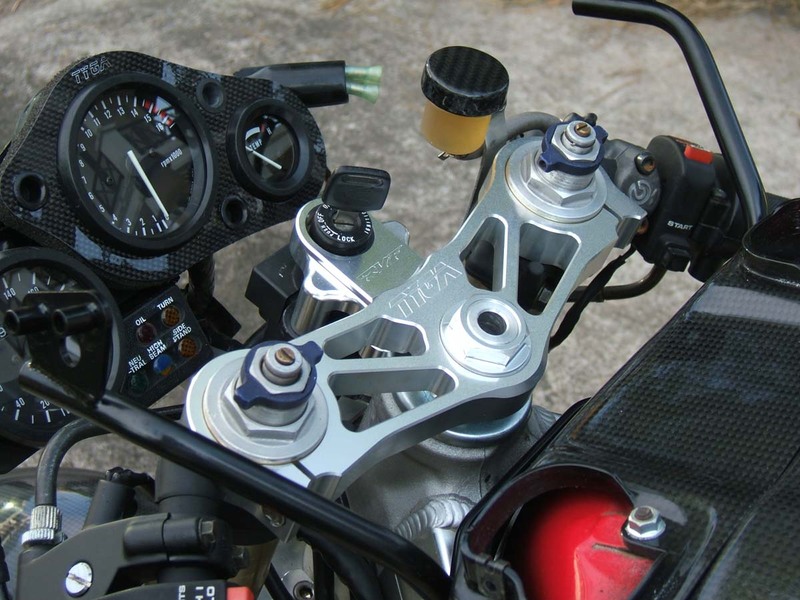 It is fitted with a matching CNC removable key holder for street use. 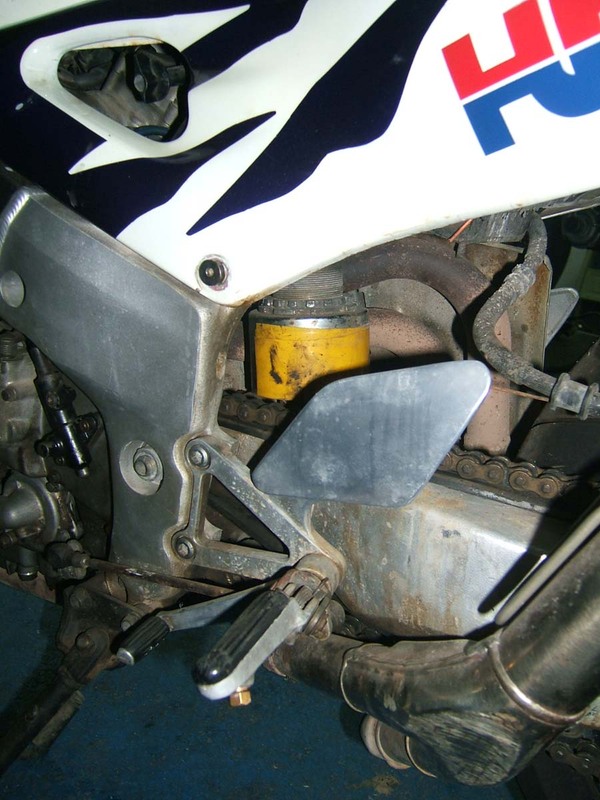 The front forks, as alluded to earlier, required rebuilding. 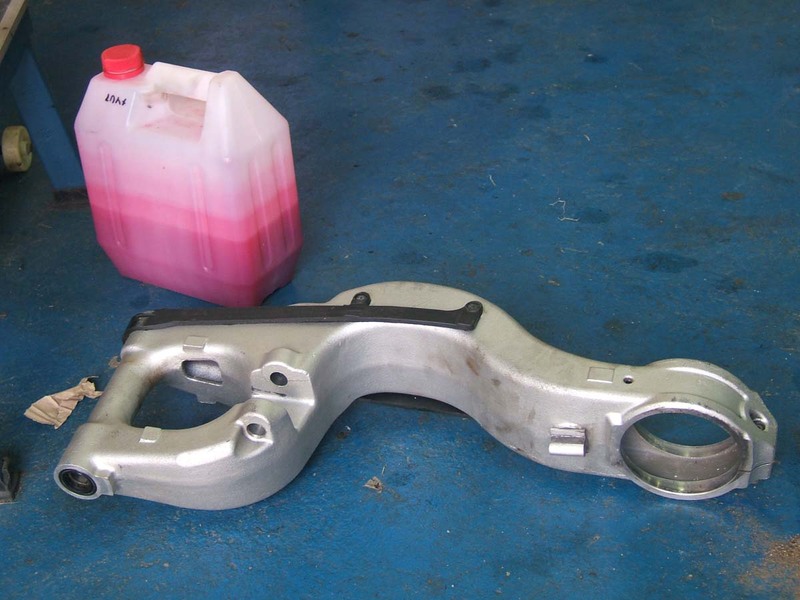 Seized components were replaced, and spring and oil levels carefully measured to match the rear shock. 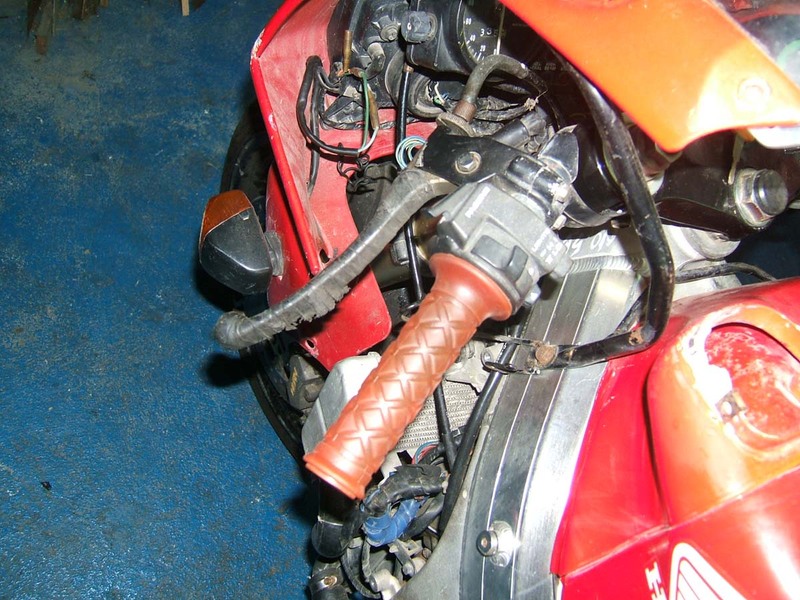 The rear shock is unique. 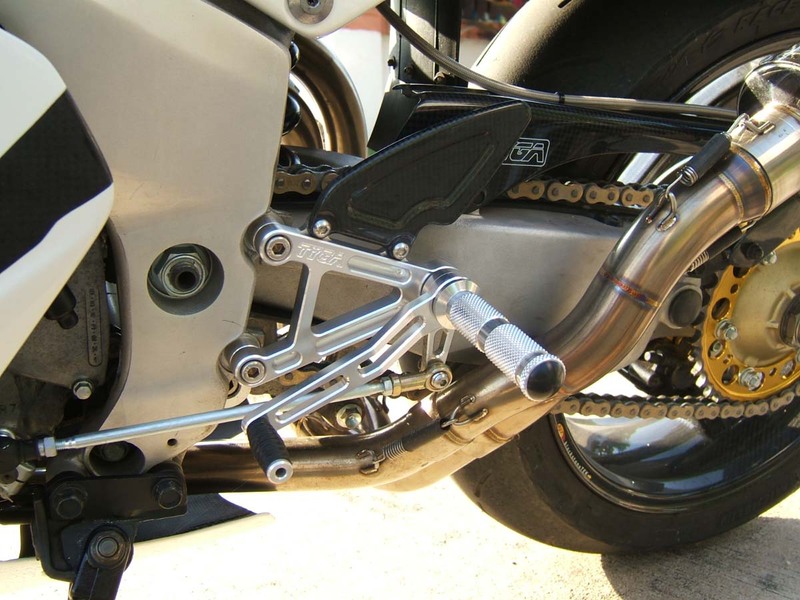 We all know that HRC recommend more ride height, but we didn't want to go the simple route of fitting a couple of spacers, so we ended up with a combination of an HRC Formula 3 NSR250 body which uses the RVF spring and internals. 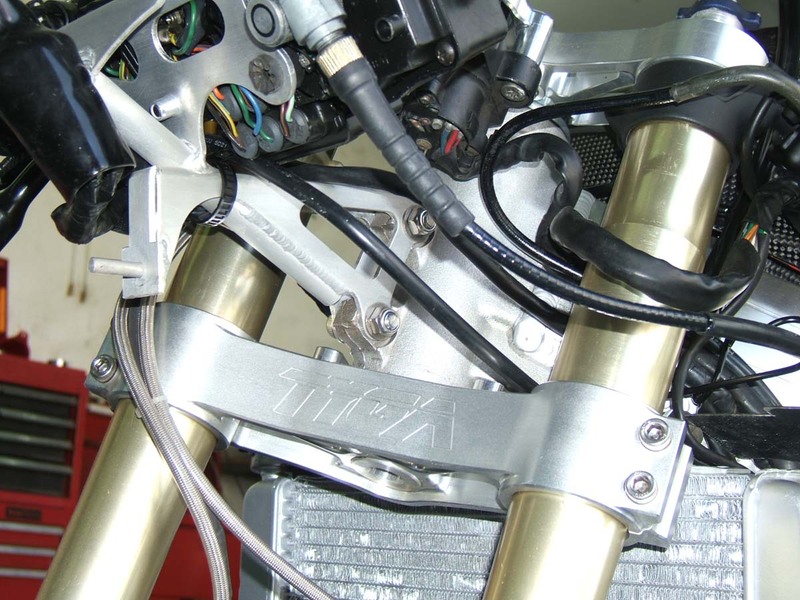 The result is a fully adjustable lightweight suspension unit with a remote reservoir. 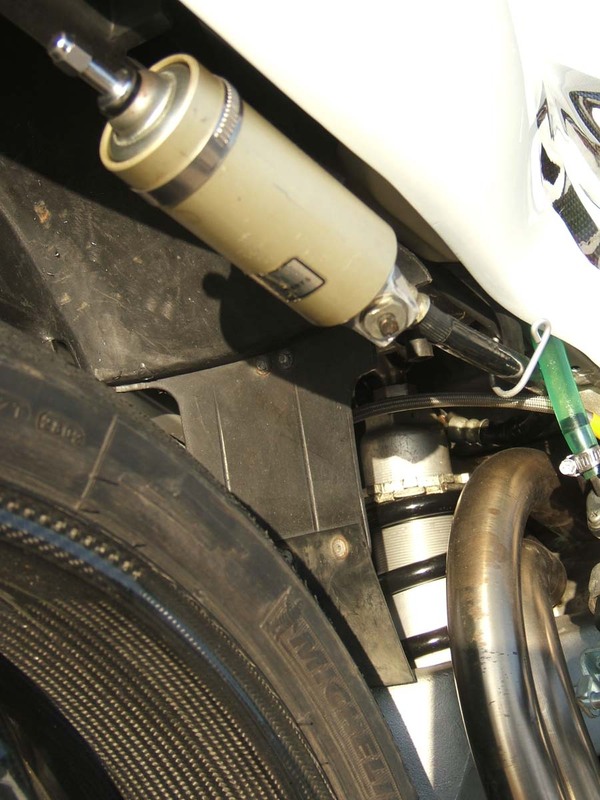 It incorporates more ride height (adjustable) as well as preload, compression and rebound damping adjustment. 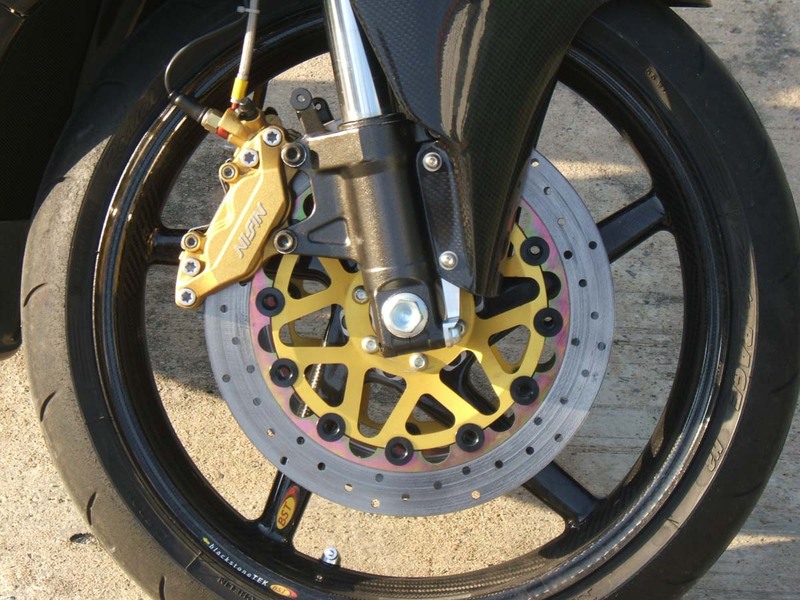 The front brake system uses a Brembo radial master linked to CBR929 calipers via HEL braided lines. 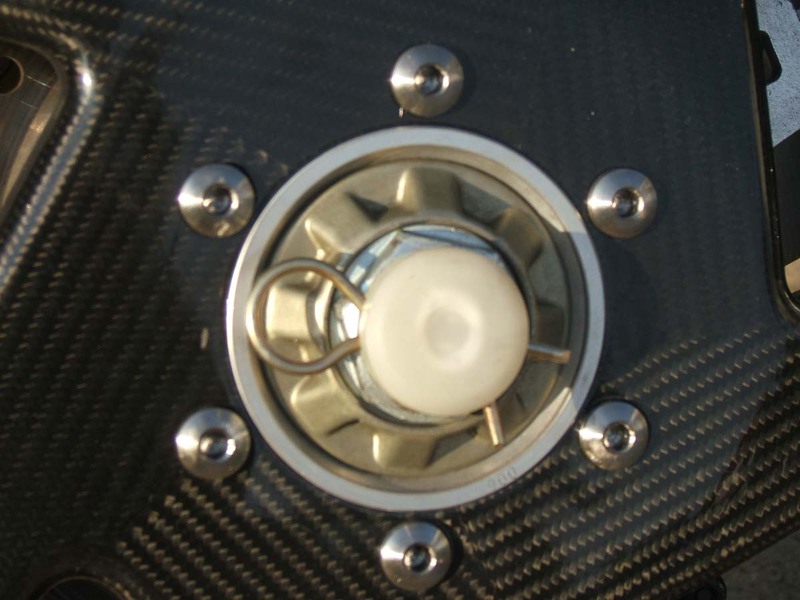 The rotors are replacement stainless and the brake system is fitted with an inline pressure brake light switch. 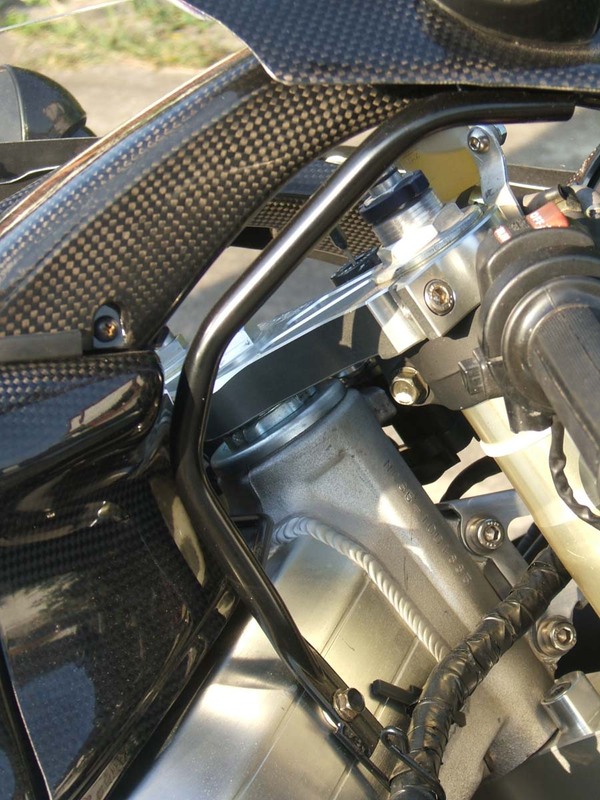 The rear brake system is stock for the most part, although it too has a HEL line attached and is fitted to our TYGA step kit with an HRC rear brake reservoir attached to the master. 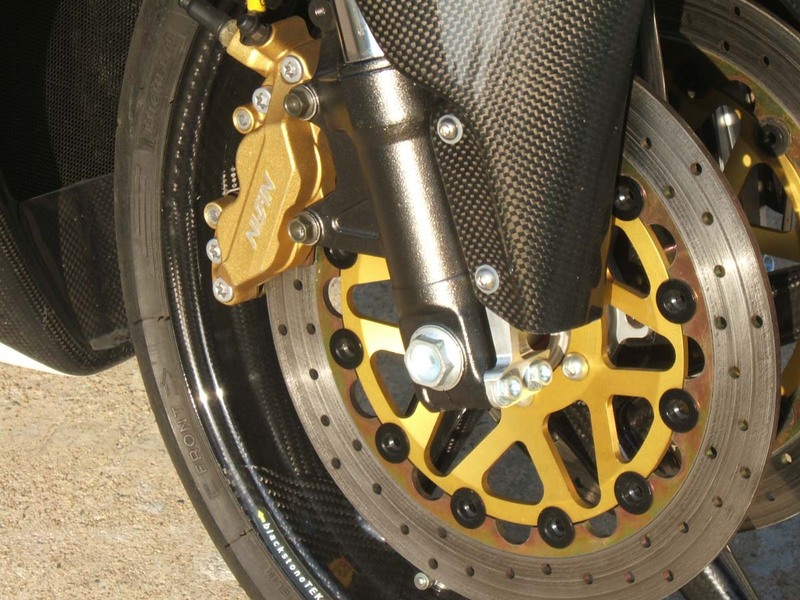 The front Brembo master uses one of our mini pots with the carbon lid. 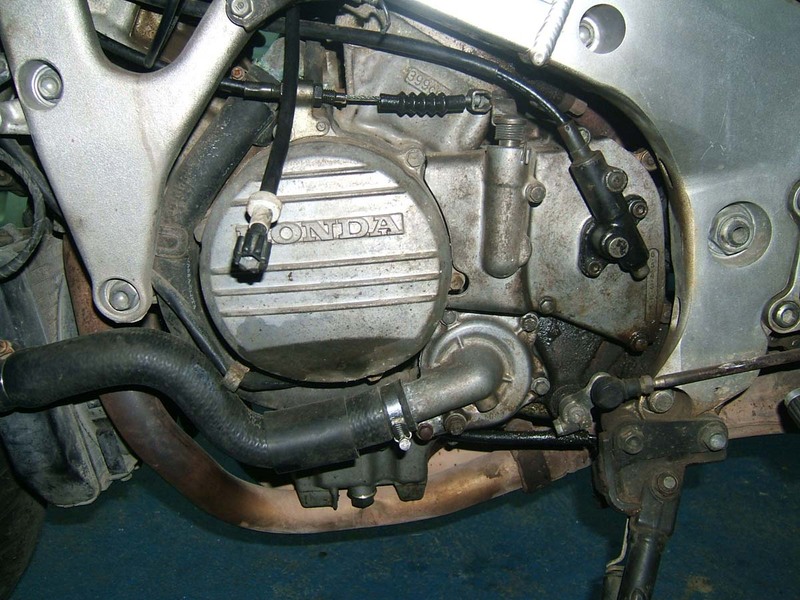 Engine was kept stock and serviced with new plugs and filters and got a fill of high quality Castrol R4 oil. 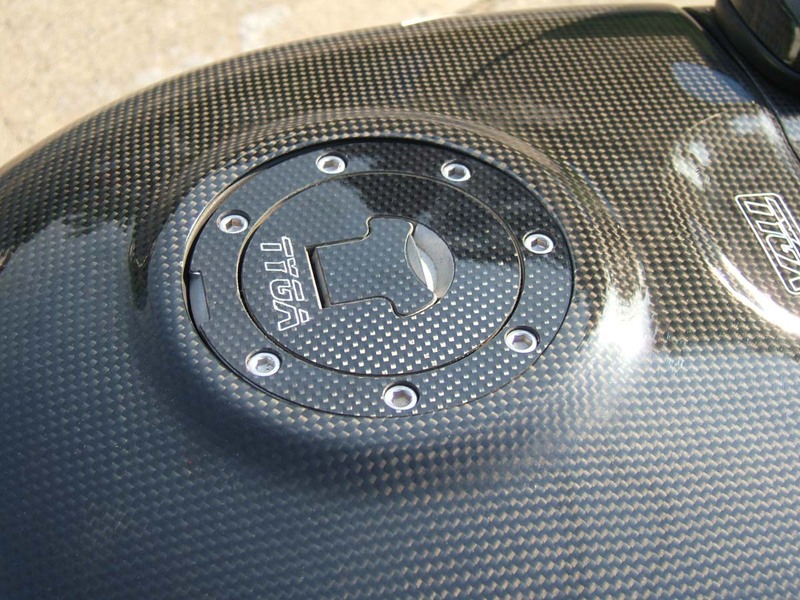 We fitted our carbon airbox lid, and anticipating the TYGA full race exhaust system, the jets were changed to suit. 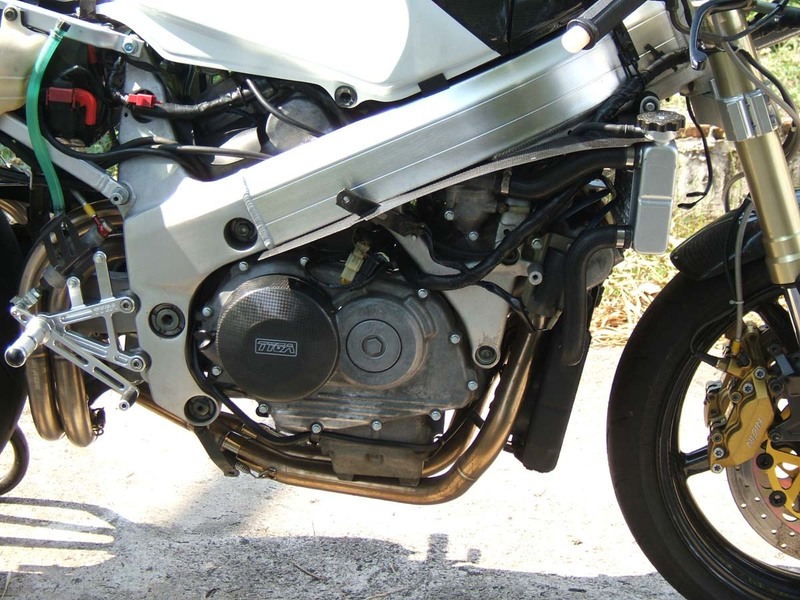 The bike is fitted with an HRC CDI for extra over rev and now the bike is good for about 60 reliable rear wheel horsepower with a good spread of power throughout the rev range. The rest of the performance enhancements came from the shedding of more weight. 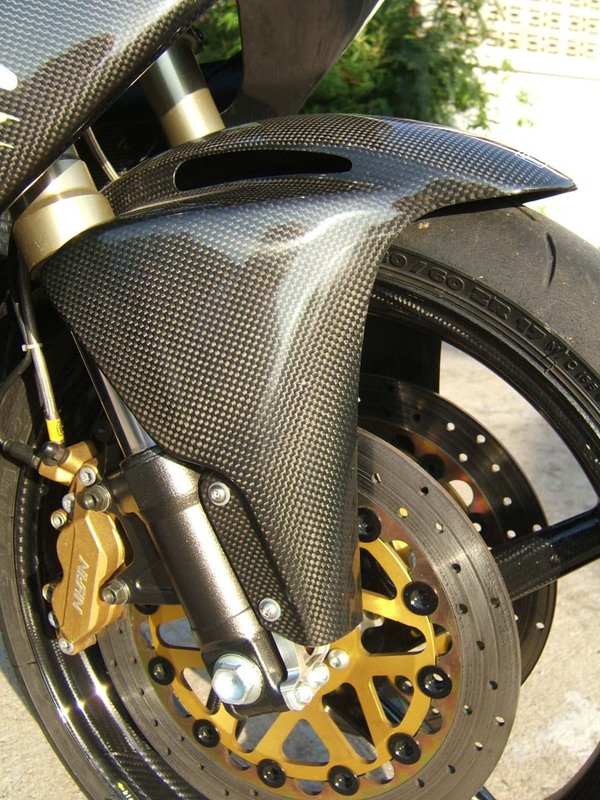 The stock plastic fairings, which were in poor condition were replaced by lightweight carbon ones. 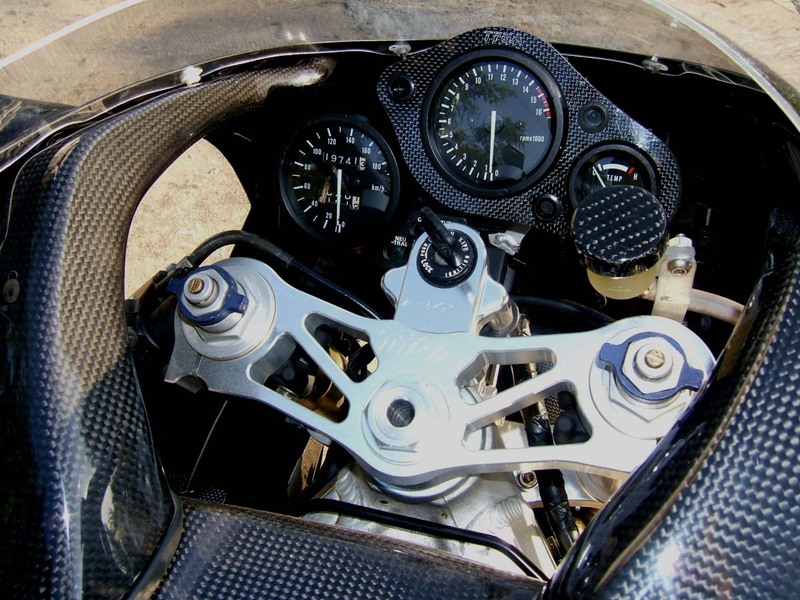 The seat cowling in particular was much lighter because being single seater and one piece, we could bin the passenger perch, the locking device and a load of brackets. 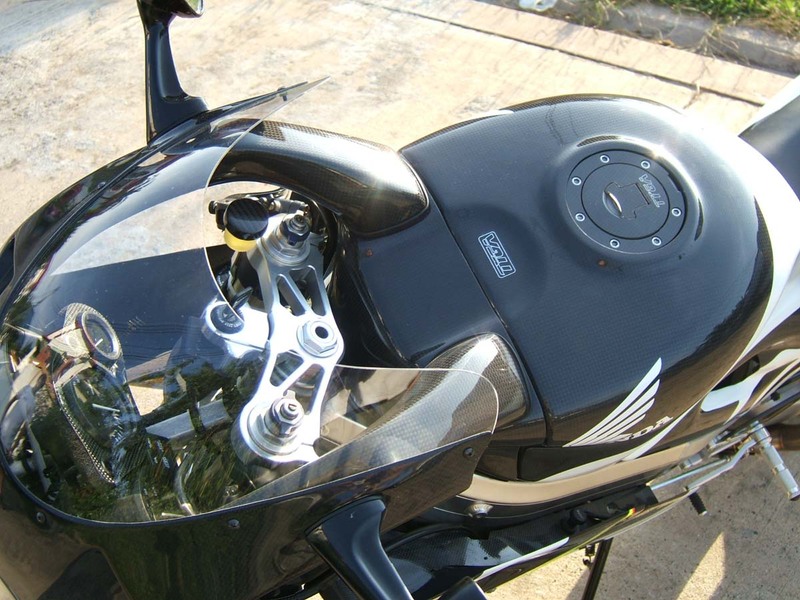 The upper fairing is one piece incorporating the two side inspection covers. 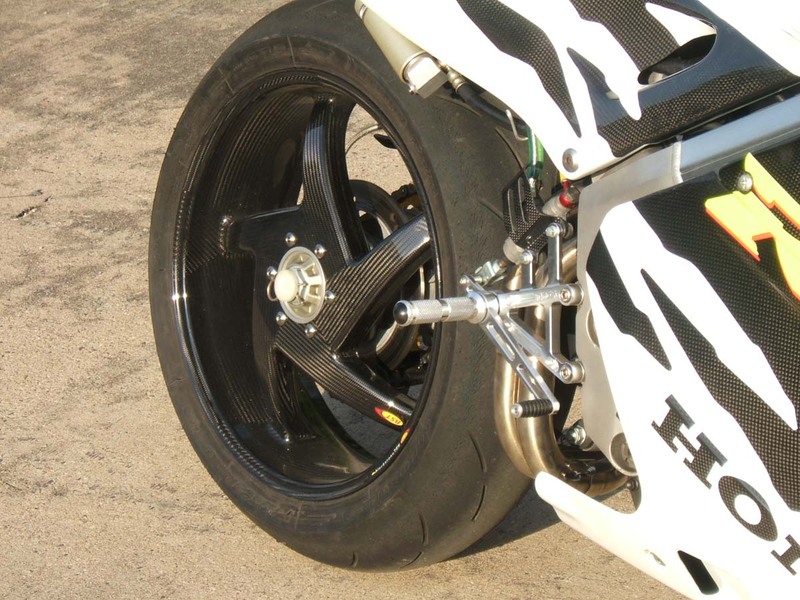 The lower incorporates the inner 'v' piece, making the fairing a simple two piece affair instead of the stock 6 piece one. 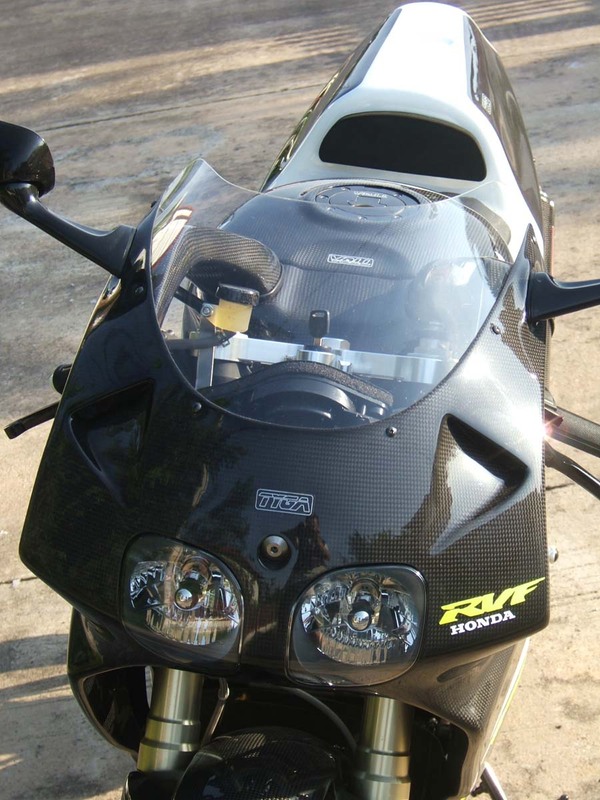 The upper uses the stock headlight but we smoothed over the indicator positions. These can be drilled if required. 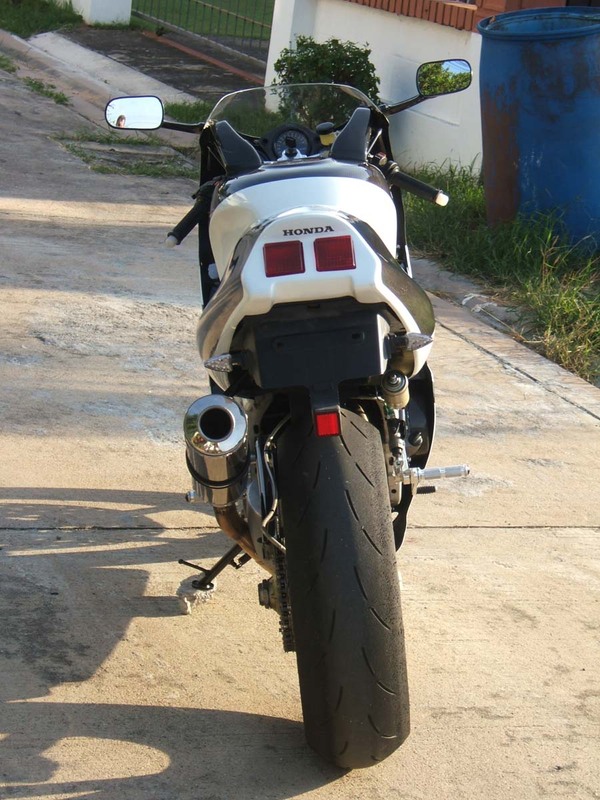 The rear indicators are mini LED items. The screen is TYGA stock shape, as is the upper stay. 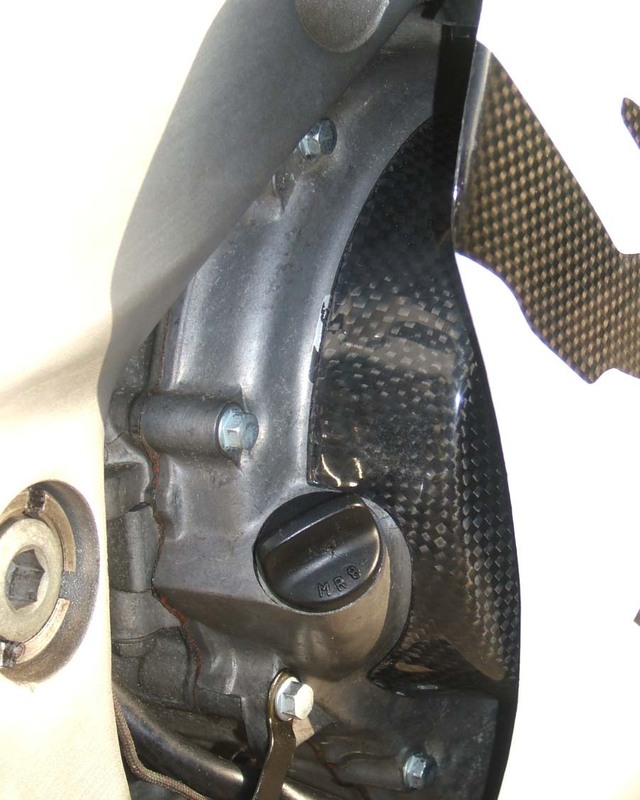 The front meter stay is also stock shape but a lightweight aluminium TYGA one. 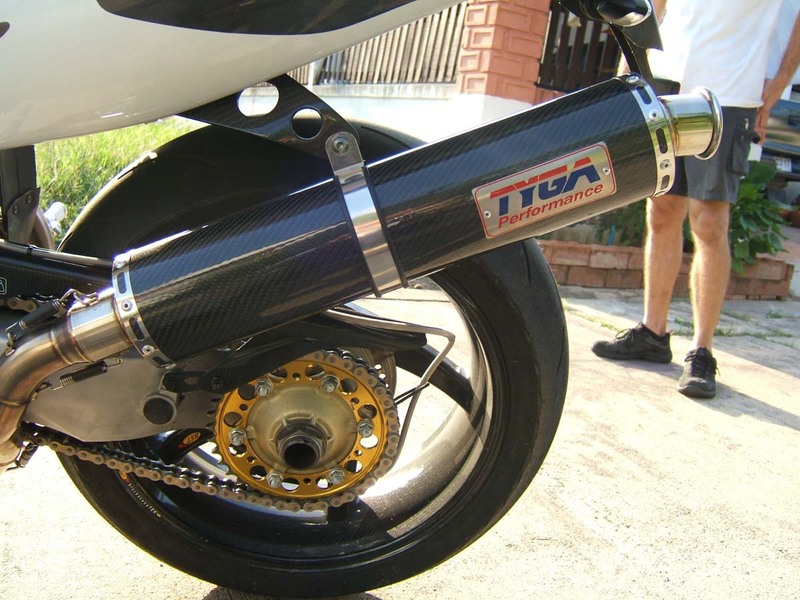 The front fender is the TYGA universal sports fender and is the one area where we strayed from the stock shape. 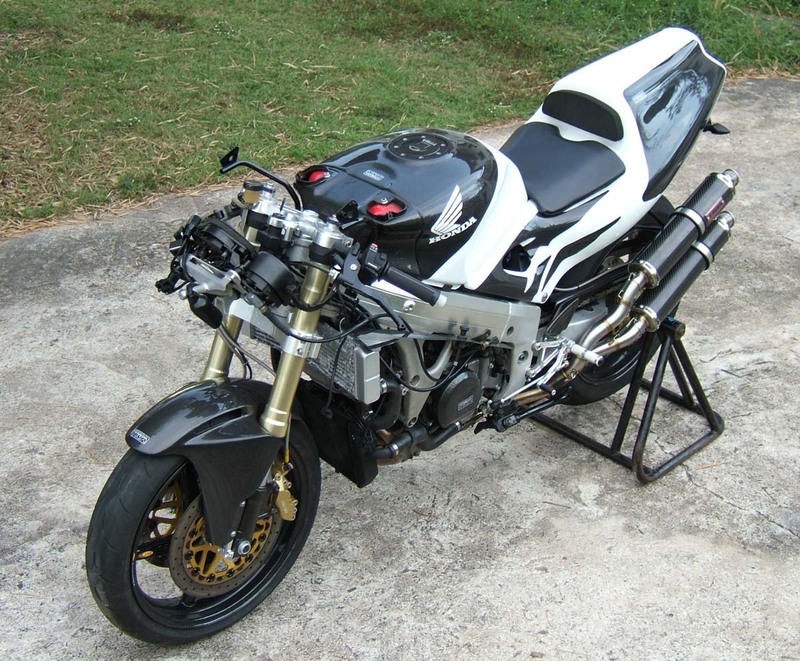 Paintwork was done to a very high standard by a friend who used to paint Ferraris and Lambos for a living. 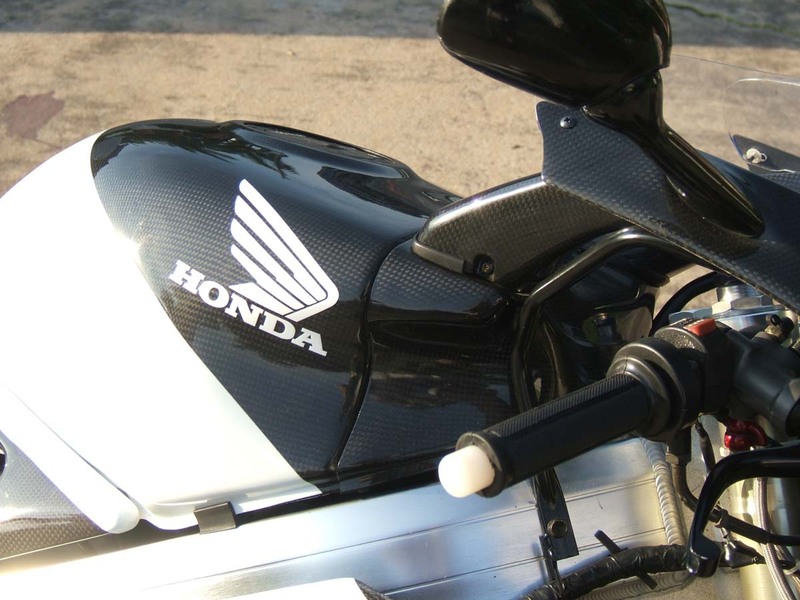 The scheme is the stock graphics but with the carbon finish being substituted instead of the red. 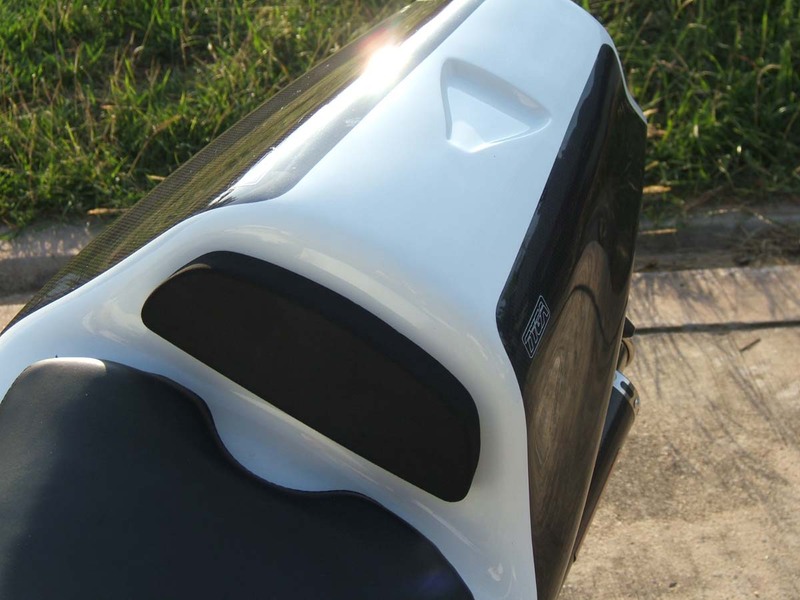 The beauty of making the carbon tank cover is that it will now be possible to ship a complete body kit including tank cover ready painted to be installed in minutes. 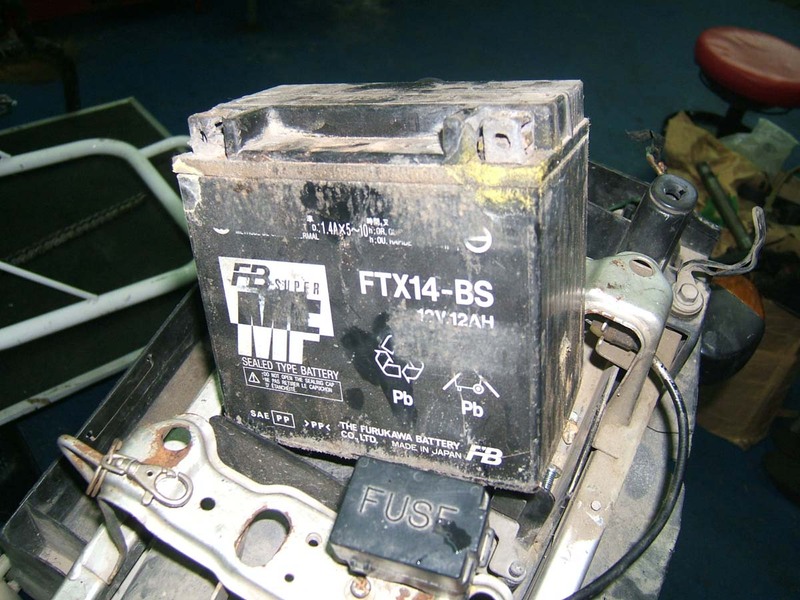 This could be provided in carbon or in GRP and is something we will be offering in the near future. 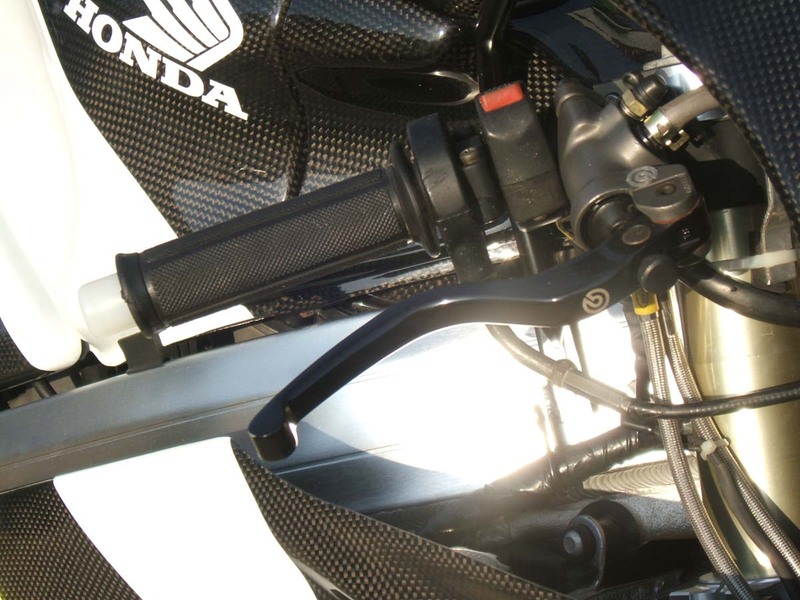 The exhaust system is our third generation full race system in stainless steel fitted to a carbon silencer which is held in place by a carbon exhaust stay. 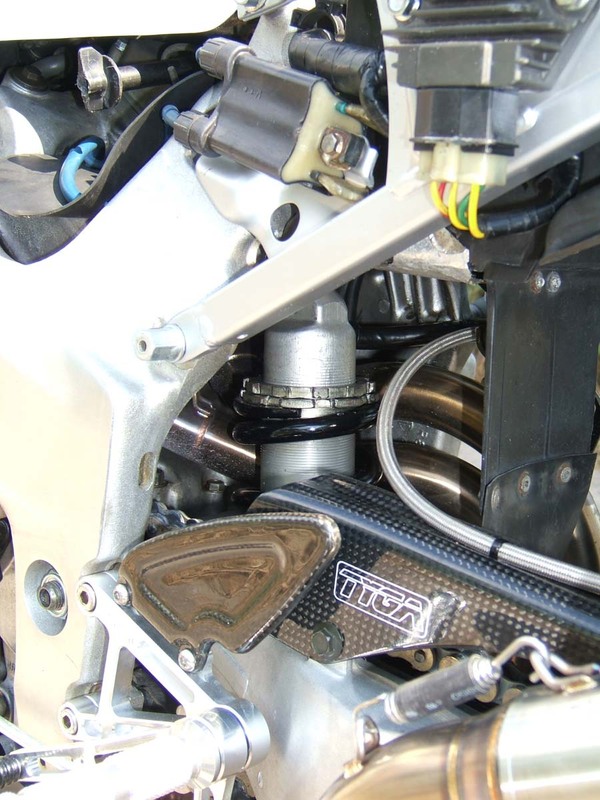 Apart from the obvious performance gains with good power throughout the rev range, there is a huge weight saving over the stock system and the precision bent and welded tubes add to the aesthetic appeal of the bike. 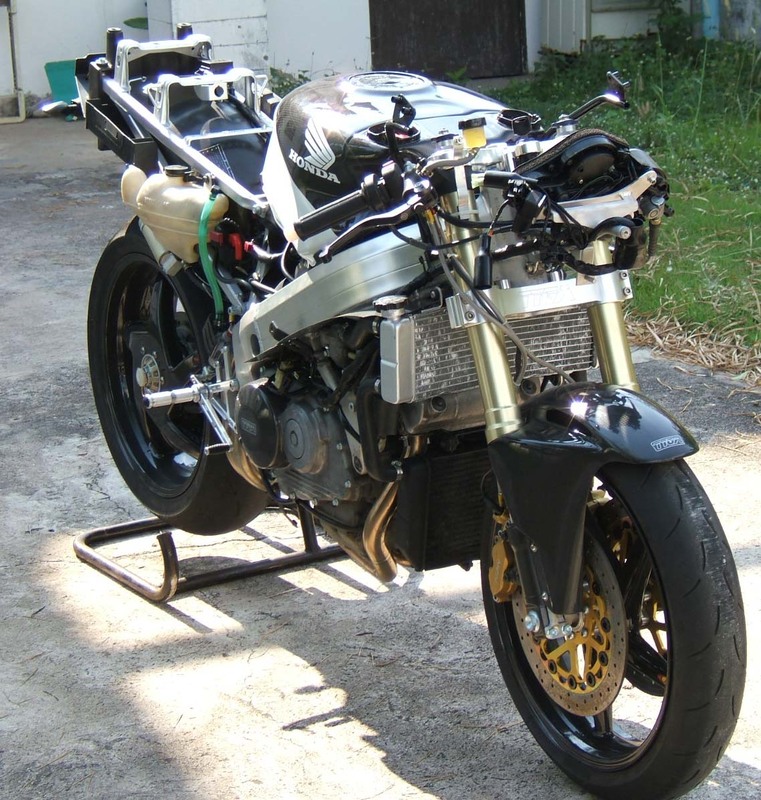 Below are some more shots of the bike with fairings removed showing off the new CNC TYGA triple clamps, the engine cases and exhaust system. 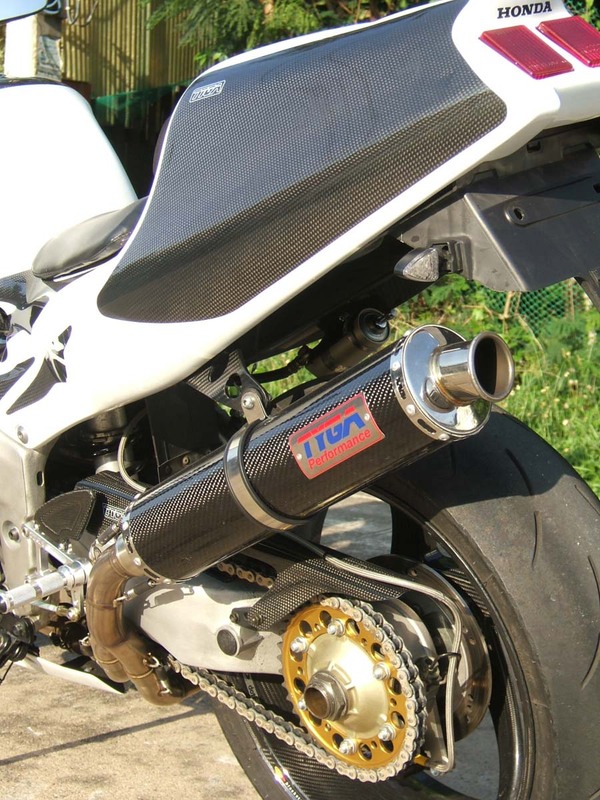 We have shown pictures with twinstack system for comparison with the conventional single carbon silencer version of our exhaust. 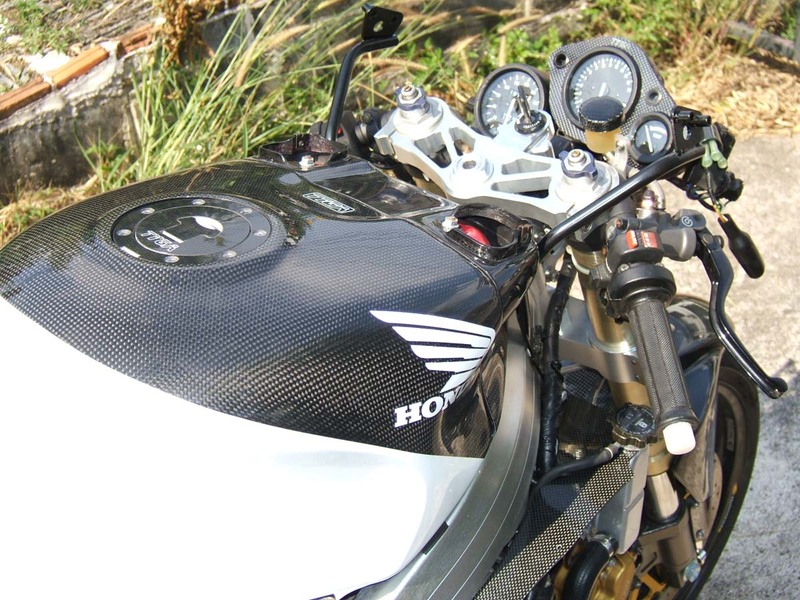 Under the tank is the carbon high volume air box. Apologies for the state of the radiators. They work but we have a plan to upgrade them in the future. 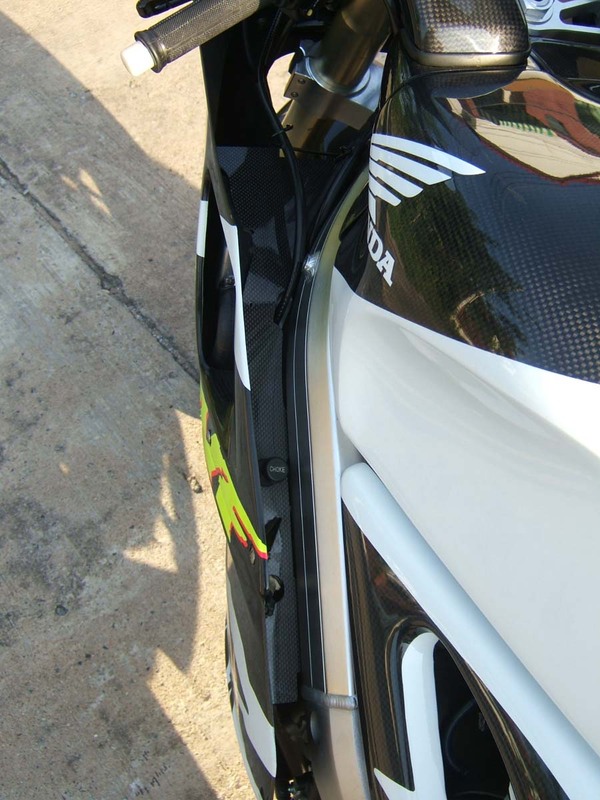 So how did it perform on its first date to the latest Bira Circuit track day? I must admit, I was a bit apprehensive as this was the shake down and I didn't want to push the limits. 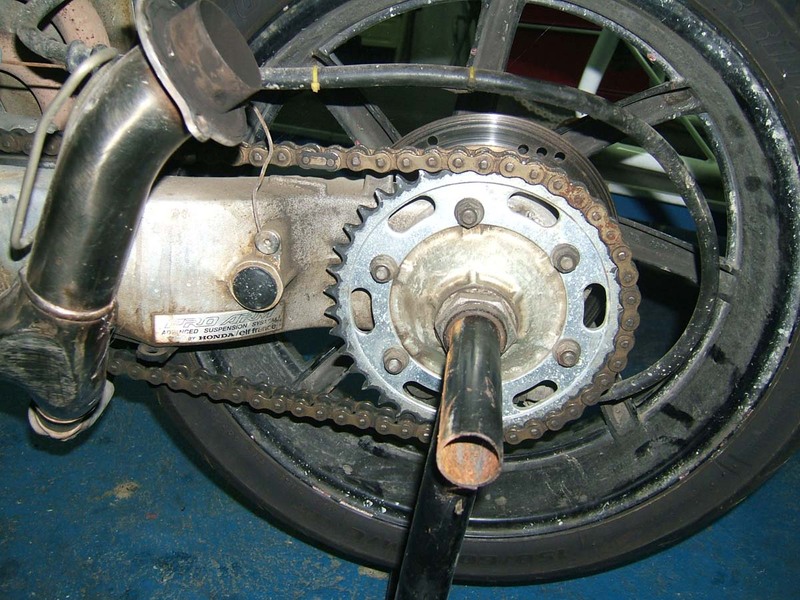 Once the brakes bedded in, my confidence grew and the bike performed well. 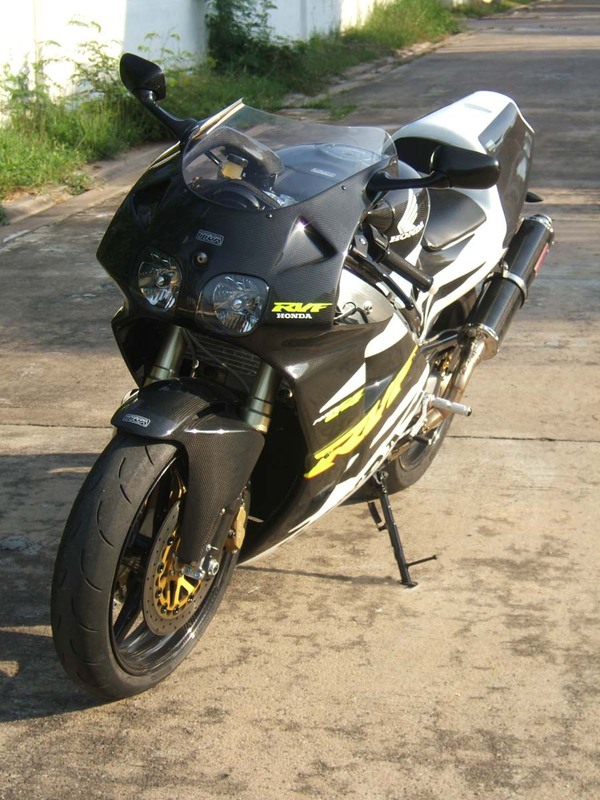 The power delivery was smooth, suspension stiffer than stock but working well. The loftier seating position adding to the sporting credentials. Parking at the paddock, there was hardly a moment the whole day when it wasn't been given some attention by onlookers and it definitely passed that test. I was reluctant to throw it away down the track before we had even taken photos so the full performance test will have to wait. The ride back was a bit more frantic including a race with a Westfield (thanks Jules) and by the time I had got back to base I was grinning from ear to ear which is really what makes the hard work all worthwhile! 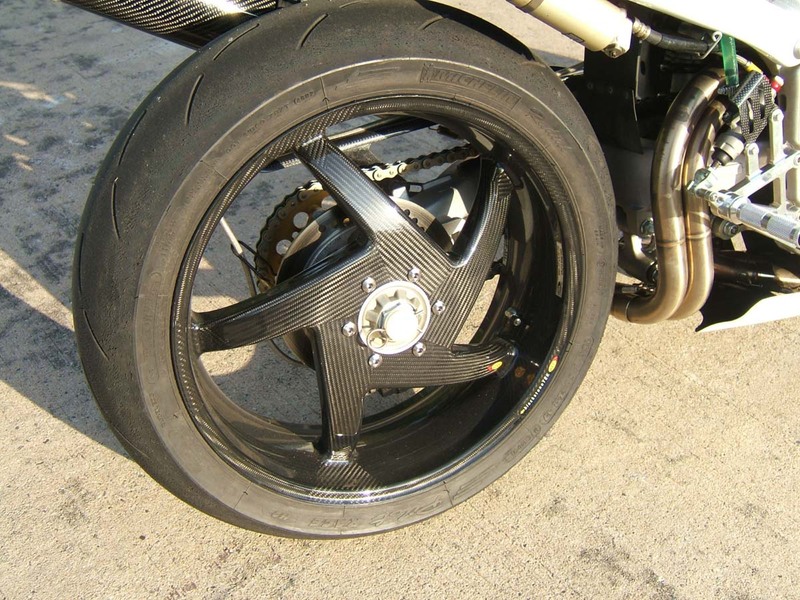 A special thanks goes to BST, and Joseph Lee at Sporting Motorcycles for supplying the carbon wheels without which this project would not be complete. Meter Stay, NC35, Stock Type, Assy. 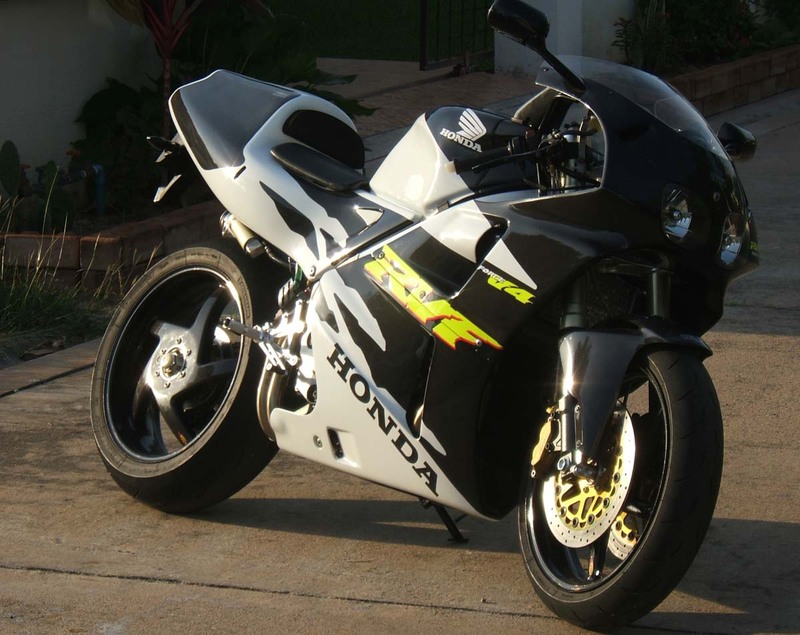 Screen Clear, Stock Shape, NC35, Kit.